AVO increased the Volcanic Alert Level to Advisory and the Aviation Color Code to Yellow for Augustine on 22 September due to an increase in seismic activity below the summit over the previous week. During 22-25 September, the earthquakes were generally less than M 1 and were located at shallow depths beneath the summit. Low-level activity at Augustine declined during the latter half of 2006 through January 2007 (BGVN 31:12, 31:04). By August 2006, seismicity was near background levels. The Alaska Volcano Observatory (AVO) noted ongoing degassing and a small seismic increase in late 2007 and into 2008. AVO raised the Volcanic Alert Level to Advisory and the Aviation Color Code to Yellow on 22 September 2007. This increase was prompted by an increase in seismic activity below the summit during the previous week. During 22-25 September 2007, the earthquakes were generally less than M 1 and were located at shallow depths beneath the summit. According to AVO, seismic activity remained slightly above background levels into January 2008. Images of Augustine in October 2008, August 2009, and August 2010 showed degassing (figure 33). Figure 33. 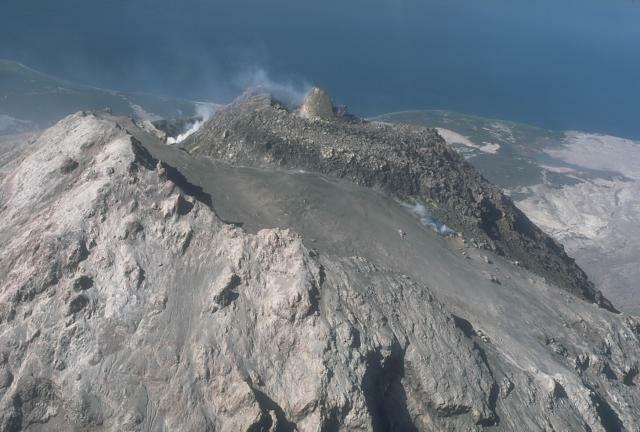 Aerial photo of Augustine taken on 19 August 2010 showing the summit amid moderately strong fumarolic degassing. Courtesy of Taryn Lopez and AVO/ USGS. Despite its relative calm, Augustine was selected as one of Alaska's potentially most hazardous volcanoes, and the USGS announced in August 2009 that Federal stimulus funds would "raise monitoring up to optimal levels" at the Cook Inlet volcanoes of Augustine, Spurr, and Redoubt (figure 34). Figure 34. Map of the Alaskan Cook Inlet area, indicating the location of Augustine and nearby volcanoes and towns. Courtesy of Janet Schaefer and AVO / Alaska Division of Geological & Geophysical Surveys. Increased monitoring may include direct measurements at fumaroles of temperature and gas chemistry (e.g., thermocouple data and SO2 measurements with an ultraviolet spectrometer), as well as sampling gases in an evacuated chamber for later analysis in a laboratory (figure 35). Figure 35. Photo of Taryn Lopez engaged in field work at a fumarole next to Augustine's summit. Although the photo was not dated, the caption noted that her work was ARRA-funded, so the photo must have been taken after mid-2009. Photo from the USGS Multimedia Gallery. The USGS press announcement stated that "Volcano monitoring is only effective if linked to rapid means for communication of hazard information to communities, businesses, government agencies, and the public. ARRA [stimulus] funds will be used to modernize instrumentation and information systems to state-of-the-art, providing the necessary tools to communicate hazard information quickly to those who need it." Information Contacts: Alaska Volcano Observatory (AVO), a cooperative program of a) U.S. Geological Survey, 4200 University Drive, Anchorage, AK 99508-4667 USA (URL: http://www.avo.alaska.edu/), b)Geophysical Institute, University of Alaska, PO Box 757320, Fairbanks, AK 99775-7320, USA, and c)Alaska Division of Geological & Geophysical Surveys, 794 University Ave., Suite 200, Fairbanks, AK 99709, USA; Taryn Lopez, Alaska Volcano Observatory, Geophysical Institute, UAF, Fairbanks, Alaska, USA. AVO reduced the Concern Color Code at Augustine from Yellow to Green on 9 August. Seismic, satellite, and visual data indicated a decrease in activity to background levels. No changes were seen at the summit during the previous several months. AVO warned that the lava dome and surrounding area were still unstable despite the apparent cessation of lava-dome growth. Rockfalls and avalanches were still occurring, especially on the N flank, and may continue for several weeks or months. According to the Anchorage VAAC, a pilot reported that on 27 July an ash plume from Augustine reached an altitude of 1.5 km (5,000 ft) a.s.l. and drifted SSE. The AVO did not find seismic evidence for this event, and seismicity levels remained low. They also stated that rockfalls and avalanches of hot debris from the cooling lava dome can produce small, localized ash plumes. AVO reduced the Concern Color Code at Augustine from Orange to Yellow on 28 April. As of the 28th, instrumental and visual observations indicated that the growth of the summit lava dome and lava-flow emissions had stopped, or continued at very low rates. Seismic data showed that rockfalls and avalanches occurred at a diminished level. No changes were seen at the summit during the previous several weeks. AVO warned that despite the apparent cessation of lava-dome growth, the new dome and lava flows are still highly unstable, and rockfalls and avalanches are still occurring and may continue for several weeks or months. Eruptive activity continued at Augustine during 14-21 April, with seismicity, rates of rockfall signals, and visual observations indicating continued lava effusion. On 17 and 18 April, a flurry of signals associated with avalanches occurred that were larger than those seen in the previous few weeks. Based on aerial observations on the 19th, it seemed that an active rockfall and avalanche chute had developed near the margin of the new lava flow/dome complex in the NW summit area. A blanket of ash related to recent rockfalls in this area was visible on the volcano's SW flank. Augustine remained at Concern Color Code Orange. Activity at Augustine declined to low levels during 7-14 April, with seismicity decreasing to slightly above background levels, and rockfalls and avalanches decreasing in frequency in comparison to previous weeks. Low-level eruptive activity continued, consisting of slow effusion of lava at the summit accompanied by small rockfalls and avalanches on the volcano's flanks. Satellite imagery showed a decline in thermal output consistent with the decreased activity. Sulfur-dioxide gas measurements showed continued high levels of magmatic gas emissions that may have been associated with degassing of lava at the summit of the volcano. Augustine remained at Concern Color Code Orange. Low-level eruptive activity continued at Augustine during 31 March to 4 April, although it was at lower levels than in previous weeks. The seismic network continued to record signals that were associated with occasional hot block-and-ash flows, rock avalanches, rockfalls, and lava flows. Small and dilute ash clouds resulting from these processes were likely confined to the immediate vicinity of the volcano. Satellite imagery continued to show a thermal anomaly at the volcano's summit. Airborne sulfur-dioxide gas measurements revealed continued magmatic gas emissions. Low-light camera observations indicated that activity was restricted mainly to the summit lava dome. Augustine remained at Concern Color Code Orange. Low-level eruptive activity continued at Augustine during 24-31 March. Signals continued to be recorded by the seismic network that were associated with occasional hot block-and-ash flows, rock avalanches, rockfalls, and lava flows. Small and dilute ash clouds resulting from these processes were likely confined to the immediate vicinity of the volcano. Satellite imagery continued to show a thermal anomaly related to the new lava dome and lava flow. Airborne sulfur-dioxide gas measurements showed continued high levels of magmatic gas output. Low-light camera observations indicated that activity was restricted mainly to the summit lava dome. Augustine remained at Concern Color Code Orange. Low-level eruptive activity continued at Augustine during 17-24 March. All available information indicated that the lava dome continued to grow, but the growth rate slowed in comparison to the previous week. Signals from small block-and-ash flows, rock avalanches, rockfalls, and lava flows continued to be recorded by the seismic network though at a decreased rate. Web-camera views showed continued steaming at the summit and occasional small rockfalls. Thermal anomalies continued to be visible on satellite imagery. Low-light camera images showed a decrease in thermal features in the volcano's summit area and on the upper NE flank compared to the previous week. Visual observations during 15-22 March revealed no large-scale dome growth. Decreased SO2 gas emission was measured on 22 March in comparison to 10 and 16 March. However, the level of SO2 emission was comparable to levels in late February and early March, and remained well above background. AVO reported that dome-building eruptive activity will likely continue, perhaps intermittently, over the next several weeks or months. Augustine remained at Concern Color Code Orange. Low-level eruptive activity continued at Augustine during 10-17 March. The seismicity changed from periods of prolonged volcanic tremor and closely spaced discreet earthquakes to episodic short-duration events. This change indicated that steady effusion of lava and dome growth gave way to activity characterized by slower effusion of lava and intermittent block-and-ash-flows, rock avalanches, and rockfalls originating from the summit lava dome. Observers saw numerous hot avalanches and prolonged periods of incandescence in the summit area and on the upper NE flank on several evenings. Satellite images showed that thermal anomalies persisted. Observations made during overflights of the volcano indicated that two lava flows on the N and NE flanks continued to advance slowly. Occasional collapses of the lava-flow fronts shed hot blocks and produced minor ash emissions. Photographs indicated that the new lava dome was about 70 m higher than the level of the lava dome formed in 1986. Augustine remained at Concern Color Code Orange. Low-level eruptive activity continued at Augustine during 3-10 March. The overall level of seismicity increased, with periods of prolonged volcanic tremor and an increase in the frequency of small volcano-tectonic earthquakes. The seismic network, particularly on the E flank, continued to record block-and-ash-flows, rock avalanches, and rockfalls that originated from the summit lava dome. Vigorous steaming was seen on 9 March, mostly from fumaroles on the S and W sides of the dome. Observations on 8 and 9 March revealed that small-scale collapses of the summit lava dome occurred regularly, usually producing block-and-ash-flows and small diffuse ash clouds. The block-and-ash-flows occurred on the E to NE sector of the volcano and extended to within ~1 km of the coastline. Airborne measurements of gas emissions on 9 March indicated both SO2 and CO2 gas in the plume. This was the first time since the fall of 2005 that CO2 had been a component of the gas plume, and likely indicated the presence of new magma entering the volcanic system. All available information indicated that the lava dome at the volcano's summit continued to grow. According to AVO, over several days before 10 March the rate of dome growth increased relative to the past several weeks, probably reflecting the influx of new magma. Augustine remained at Concern Color Code Orange. Unrest continued at Augustine during 24 February to 3 March, with overall seismicity remaining low, but above background levels. Rockfalls and avalanches originating from the summit area continued to be recorded by the seismic network. Since inflation commenced on 10 February, a vertical change of 2-3 cm was measured by GPS (Global Positioning System). A thermal anomaly at the summit was visible on satellite and camera images, and incandescent avalanches were observed. All available information indicated that the lava dome continued to grow slowly. A plume composed of variable amounts of gas, steam, and small amounts of ash was emitted intermittently from the summit. Augustine remained at Concern Color Code Orange. During 21-27 February, seismicity at Augustine was relatively low, but remained above background levels. Seismic data indicated that small rockfalls and avalanches from the lava dome occurred intermittently. A thermal anomaly was visible in the summit area on satellite and camera imagery. These data indicated that the lava dome at the volcano's summit continued to grow slowly. Observations during the report week revealed that a plume composed of variable amounts of gas, steam, and small amounts of ash was emitted intermittently from Augustine's summit. Augustine remained at Concern Color Code Orange. During 15-19 February, AVO seismometers at Augustine recorded occasional rockfalls and small pyroclastic-flow signals indicative of minor collapses of the volcano's lava dome. During the previous week, the number of these events declined, suggesting that the rate of lava effusion may have slowed. Clear satellite views of the volcano on 16 February showed a thermal anomaly in the summit crater area. On the 19th, the web camera showed a light dusting of ash on the ENE flank of the volcano. AVO stated that during the report period a plume composed of variable amounts of gas, steam, and small amounts of ash was probably being emitted intermittently from Augustine's summit. They warned that occasional very localized ash clouds and light ashfall will be produced by collapses from the lava dome. Augustine remained at Concern Color Code Orange. During 8-14 February, seismicity at Augustine remained at low levels, but was still above background. Also, low-level ash plumes and occasional pyroclastic flows occurred. Satellite and seismic data, and other remote observations indicated that a lava dome had been growing at the volcano's summit since 28 January. On the evening of 7 February, gas, ash, and incandescent blocks were observed descending the upper NE flank of Augustine. All available data indicated that as the lava dome grows, it periodically becomes unstable and small portions of it avalanche down the N flank, producing pyroclastic flows. The number of these flows gradually decreased during several days before 10 February, suggesting that the rate of lava extrusion also slowly declined. Data from continuous GPS receivers on the island indicated that the flanks of the volcano began to deflate around 28 January, marking a reversal in the swelling trend observed beginning in roughly June of 2005. AVO reported that based on all available data, eruptive activity associated with lava-dome building will continue over the next few days or weeks and may continue intermittently over the next several months. Augustine remained at Concern Color Code Orange. During 1-7 February, occasional pyroclastic flows continued to travel down Augustine's flanks and low-level ash plumes reached no higher than 4.6 km (15,000 ft) a.s.l. on satellite imagery. On 3 February, seismicity decreased significantly, but remained above background levels. Seismicity remained low throughout the remainder of the report period. Satellite imagery from the evening of 6 February showed a persistent thermal signal and occasional light ash emission. On 7 February, a steam plume was visible rising ~150 m (~500 ft) above the summit. AVO warned that further explosive activity producing ash clouds to heights over 7.6 km (25,000 ft) may still occur with little or no warning. Augustine remained at Concern Color Code Orange. 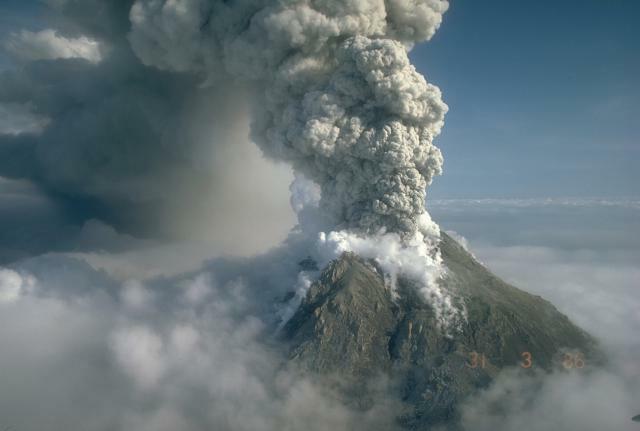 After several days with no ash emissions and relatively low seismicity, Augustine erupted again on 27 January around 2001, with the most vigorous activity beginning around 2024. The eruption lasted about 9 minutes. AVO raised the Concern Color Code from Orange to Red, the highest level. According to the National Weather Service (NWS), the ash plume produced from the eruption reached ~12.2 km (40,000 ft) a.s.l. and drifted SE. An ashfall advisory was issued by the NWS. That same day, an eruption at 2337 lasted 1 minute and produced an ash plume below 3 km (10,000 ft) a.s.l. On 28 January at 0204 a 2-minute-long eruption began that sent ash to a height of 7.9 km (26,000 ft) a.s.l. and drifted SE. Later that day a 3-minute-long eruption began at 0742 that sent a NE-drifting ash plume to a height of 7.6 km (25,000 ft) a.s.l. Augustine was in a state of continuous eruption from 1430 on 28 January through 31 January. The activity was characterized by steady ash emission and small pyroclastic flows. An observation flight on 29 January revealed diffuse drifting ash clouds at a height of ~7.6 km (25,000 ft) a.s.l. Also, ash-and-steam clouds rose from pyroclastic flows on the N flank of the volcano. Steam plumes rose from the NNE coastline, indicating that some of the pyroclastic flows had entered the sea. Satellite imagery on 31 January showed that plumes did not exceed 3.9 km (13,000 ft) a.s.l. and generally drifted N. According to a news article, Alaska Airlines cancelled flights to and from Anchorage on 30 and 31 January due to ash from Augustine in the airspace. Observations made during an overflight on 18 January indicated that the summit was steaming vigorously, consistent with the formation of a new lava dome. Observers also noted ballistic bombs, block and ash flow deposits, and dilute-cloud surge deposits on the volcano's flanks. A white ash-poor steam plume was observed rising to about 2.6 km (8,500 feet) a.s.l. Seismicity decreased significantly over 19-20 January, but remained above background levels through 24 January. Night-time satellite views during 22-24 January showed faint thermal anomalies. Explosive activity began at Augustine on 11 January. The day before, AVO increased the Concern Color Code from Yellow to Orange when seismicity began to increase at the volcano. On 11 January at 0444 seismic signals began to be recorded that were interpreted as being associated with explosions at Augustine's summit. The Concern Color Code was increased to Red, the highest level. Another explosion occurred at 0513, and satellite imagery confirmed that an ash plume was produced that rose to ~9.1 km (30,000 ft) a.s.l. and drifted N and E. An ashfall advisory was issued by the National Weather Service. Seismicity decreased after the explosions. During a flight over the volcano, scientists saw volcanic mudflows on the E, S, and W sides of the volcano. Minor rock and snow avalanche deposits were visible high on the SW part of the edifice. According to news articles, several flights were canceled or diverted due to ash in air space. On 12 January, the Concern Color Code was reduced to Orange. On 13 January, seismicity began to increase. An eruption on the 13th from about 0355 to 0439 produced an ash plume to 10.4 km (34,000 ft) a.s.l. On the 13th, the volcano entered a period of repetitive and explosive eruptions, with explosions occurring at 0444, 0847, 1122, and 1640. Each event produced ash plumes, mudflows, and pyroclastic flows. The ash plumes produced from these eruptions rose higher than 9.1 km (30,000 ft) a.s.l. Ash drifted ESE and a small amount of ash fell in communities of the SW Kenai Peninsula. Explosions on the 13th at 1858 and on the 14th at 0014 were similar in size and duration as the previous four. In response to these eruptions, the National Weather Service issued an ashfall advisory for the western Kenai Peninsula S of Ninilchik. No explosions were recorded later on the 14th. The level of seismic activity declined after an explosion on 14 January at 0016, so the Concern Color Code was reduced to Orange on 15 January at 0945. Observations on 16 January confirmed that pyroclastic deposits were widespread on the volcano's flanks, as seen in web camera images. Also, a small lava dome appeared to have extruded at the summit. AVO reported on the 16th that the level of seismic activity at the volcano remained above background. It is likely, but not certain, that further explosive activity will occur. Explosive events similar to those of 13 and 14 January could occur with little or no warning. During 30 December to 6 January, seismicity at Augustine increased slightly in comparison to the previous week. In addition, vigorous steaming was visible from several summit fumaroles during clear weather late in the week. Varied fumarole temperatures were recorded during a thermal survey on 4 January, but there was no significant change in the distribution of thermal features since 22 December. A significant increase in the sulfur-dioxide flux was measured on 4 January, in comparison to values on 20 December. Augustine remained at Concern Color CodeYellow. Unrest continued at Augustine during 23-30 December. Seismicity rates decreased during the week, while steam-and-gas emissions continued. Brief views of the volcano during clear weather revealed that steam was continuously emitted from the volcano. The activity continued to suggest that new magma is present beneath Augustine. Based on past eruptions at Augustine, AVO expects to see a sharp increase in earthquake activity prior to a significant explosive eruption. Augustine remained at Concern Color Code Yellow. During 16-23 December, unrest continued at Augustine, with elevated seismicity and several small steam explosions occurring. Thermal imaging of the summit area on 22 December using a helicopter-mounted FLIR (Forward Looking Infrared Radiometer) confirmed the presence of a new, high-temperature fumarole or gas vent high on the S flank of the volcano. A gas-measurement flight on 20 December detected sulfur dioxide for the first time at Augustine since routine airborne measurements began in the early 1990s. Aerial observations and analysis of photography and video of the summit area indicated that some deformation occurred within the summit crater area. A crack or fissure was noted cutting the 1986 lava dome and extending to the SE. Heavy steam from this feature, along with patches of bare ground, indicated that heat output at the summit had increased. Augustine remained at Concern Color Code Yellow. During 14-20 December, several small steam explosions occurred at Augustine and the smell of sulfur was reported by residents in a couple of villages E of the volcano. During an overflight on 12 December, AVO scientists saw profuse steaming from numerous fumaroles on the summit, emanating mainly from behind the 1986 lava dome. Several energetic fumaroles were also located ~200 m down the SE flank. A gas-and-steam plume extended ~74 km SE. Augustine remained at Concern Color Code Yellow. Seismicity remained at elevated levels at Augustine during 30 November to 12 December. On 12 December a steam plume visible on video and satellite images extended 75 km SE of the volcano. During 9-12 December, changes in the style of earthquake activity at the volcano were recorded and there were reports of gas emissions and steaming. Seismic events on 9 and 11 December may have perturbed the hydrothermal system, initiating steam explosions. These events were consistent with reports of steaming at the summit observed on 10 December, and a distinct sulfur smell ("like from a sewer") in the air on the evening of 11 December at Nanwalek and Port Graham, approximately 80 km E of the volcano. Augustine remained at Concern Color Code Yellow. On 29 November AVO raised the Concern Color Code at Augustine from Green to Yellow after recording long-term important changes in seismicity and ground deformation consistent with renewed volcanic unrest. There were no indications that an eruption was imminent or certain. Beginning in May 2005, there was a slow increase in the number of earthquakes under Augustine. The earthquakes were generally small (less than M 1) and concentrated roughly 1 km below the volcano's summit. These earthquakes slowly increased from 4-8 earthquakes per day to 20-35 earthquakes per day. Additionally, data from a Global Positioning System (GPS) network on Augustine indicated that a slow, steady inflation of the volcano started in mid-summer 2005, continuing until the present. The GPS benchmark located nearest the summit moved a total of 2.5 cm. This motion is consistent with a source of inflation or pressure change centered under the volcano. This is the first such deformation detected at Augustine since measurements began just prior to the 1986 eruption. No reports of increased steaming were received by AVO, nor have satellite data shown increased thermal activity. Explosive activity, as measured by University of Alaska Geophysical Institute infrasonic stations, began on the afternoon of 22 January, and at 0745 on 23 January the first major ash eruption occurred. A second major explosion and ashfall followed at 1645 that afternoon. At least five major eruptions took place during the following 3 days. Ash clouds penetrated the tropopause, reaching heights of 14 km as measured by ANR height-finding radars. A light dusting of ash (~1.5 mm) fell at Anchorage. Ash also fell at Iliamna, Homer, and Seldovia, Alaska. Microearthquake swarms and occasional explosions have been noted on the volcano since mid October. Island seismographs, presumably damaged by premonitory activity, stopped telemetering earthquake data about one week prior to the main eruptions. A strong increase of earthquake activity was recorded, however, on 22 January, on the University of Alaska and USGS seismic stations located on the mainland, W of the island volcano. Intense swarm activity accompanied the main eruptive phase. Lahars, mudflows and pyroclastic flows descended the flanks and some reached the sea. Vent-clearing and subsequent explosions removed much of the 1963-64 dome, resulting in a crater breached to the N.
The Burr Point Research Station (NW tip of the island) was severely damaged by blast and thermal effects from one or more nuées ardentes, and scoria and ashfall. Temperatures greater than 400°C were measured 9 feet below the surface of a pyroclastic flow E of the research station. Chemical and petrographic analyses of the first 23 January ashfall, sampled at Seldovia and Iliamna, indicates that initial melt accompanying vent breaching explosions was dacitic andesite as documented in the following partial chemical analysis: SiO2 = 63.8%, Fe2O3 = 2.1%, FeO = 2.0%, MgO = 2.1%, CaO = 5.1%, Na2O = 3.9%, K2O = 1.3%. A relatively quiet period extended from 27 January to the end of the month. Information Contacts: R. Forbes, Univ. of Alaska; P. Sventek, USAF, Cold Bay. Explosive activity resumed at 0442 on 6 February, as documented by seismic and infrasonic signals, and by another ashfall along the NW margin of the Kenai Peninsula. In the morning a muddy rain fell in Kenai and Ninilchik along with considerable ash. Another eruption occurred at 1230, and a Wien Airlines pilot reported the top of the cloud at 7.5-9 km. At 1800 on 6 February a blizzard-like ash storm occurred at Homer, becoming so dark that vehicular traffic stopped. This fall of very fine tan-colored ash was the heaviest that Homer had received during the eruption sequence. The volcano erupted almost continuously until 16 February, when the activity primarily returned to steam explosions. During that period there were an abundance of seismic and infrasonic signals. Cloud tops commonly reached heights of 3-4.5 km. The Geophysical Institute made aircraft observations almost daily 8-18 February except the 10th and 14th. The pilot observed that ash was erupted until 16 February. Geophysical Institute scientists visited Augustine on 18 February and observed occasional ash puffs but not the continuous outpouring of ash that had occurred earlier. During the period of continuous strong ash activity there had also been new nuées ardentes and the NE part of the island was again enlarged. Temperatures of 604°C were measured in the new nuée ardente, which overlay one from the first phase. This temperature was reached at a depth of 2 m, away from fumaroles. Ambient temperature was 0°C. A new lava dome was extruded, possibly on 11-12 February, and the top was about 250 m above the base. From 18 February to the end of the month the volcano was fairly quiet. Information Contacts: J. Kienle, Univ. of Alaska. A seismic array continued in operation on Augustine Island during March. The only known activity during this period was normal degassing and several earthquake swarms, with most magnitudes in the 1-2 range. Passing aircraft noted extensive steaming on 23 April (1015) and 29 April (1500), but no eruptive activity was reported during the month [but see 01:08]. Augustine was very active for a considerable part of April. The eruptions produced mostly nuées ardentes, and during the peak of this period explosions were recorded on the University of Alaska's seismic system 10-15 minutes each hour, about 100 events per day. Deposits on the N and NE sides increased considerably, including those from numerous nuées ardentes. Since the activity was nuées ardentes, the troposphere was not affected. The eruptions occurred as follows in April: 6th-9th, 6-12 per day; 10th-11th, about 1 every hour; 12th-14th, almost continuous; 15th-17th, very intense; 18th-22nd, 12 per day; 23rd, nuée ardente activity stopped. Through the rest of April and all of May the volcano quieted, pouring out large quantities of gas and steam in a steady-state situation. Some of the plumes were reported to be rather spectacular. The volcano continued its activity throughout June, continually pouring out large quantities of gas and steam. Some of the plumes were spectacular. 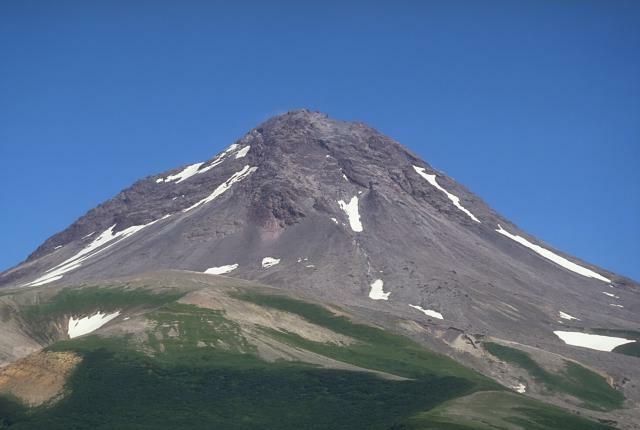 The Augustine investigation team reports that: "Degassing of ash-flow deposits an the new summit lava dome continued during July and August. There were only a few local seismic events and no new eruptive activity. "Field work during mid-August disclosed that the initial January 1976 eruptions had been the most explosive and extensive of three cycles that occurred in late January, mid-February, and mid-April. Pyroclastic flows of the January cycle extended in all directions away from the summit, reaching the sea on the S and NE sides of the volcano. One of the hot pyroclastic clouds overran Burr Point Research Station, at the northernmost tip of the island 5 km from the summit, damaging it severely. The velocity of the cloud was high enough to dent the aluminum structures. Thermal and blast effects on the structures indicate that they were hit from the side facing away from the volcano. We infer that the structures must have been damaged by a back eddy of the turbulent pyroclastic cloud that continued out to sea. "The decreasing explosivity of eruptions and extent of deposits during the February and April activity reflects a change in the mechanism of eruption, from pyroclastic explosions of January and 6 February, to block and ash flows avalanching off the newly emerging viscous andesitic lava dome in the crater during the latter part of February and April. Emplacement of the lava dome has now nearly obscured the January crater, but has not yet restored the summit to its pre-1976 elevation. "Gas samples have been collected from active fumaroles at the margin and on the flanks of the new lava dome. Temperatures up to 457°C were measured in these fumaroles. A maximum of 430°C was measured in fumaroles emitted from the February ash flow deposits, as compared to maximum fumarole temperatures of 603°C measured soon after their emplacement. Fumarolic emission from the January deposits has ceased entirely. "On the basis of the recent work and comparison to the past eruptive history of Augustine, we now believe that the explosive phase of the 1976 eruptive cycle is over and that activity in the near future is likely to be limited to local debris fall and mudflows." Further Reference. Kienle, J., and Shaw, G.E., 1979, Plume dynamics, thermal energy and long-distance transport of Vulcanian eruption clouds from Augustine volcano, Alaska: JVGR, v. 5, p. 139-164. Information Contacts: Augustine Field Party, Geophysical Institute, University of Alaska, and Univ. of Washington; D. Johnston, H.-U. Schmincke, J. Kienle, and M. Utting, Univ. of Alaska. Juergen Kienle reports that seismicity at Augustine began to increase last summer for the first time since 1976, when the volcano last erupted. Between 12 July and 7 August, approximately 300 shallow microearthquakes were recorded each day on Augustine's network of four seismic stations. From then until late February, recorded earthquakes averaged 12/day, with occasional short bursts of seismicity. A small swarm took place during September with 100 events/day over a 2-3-day period. An intense peak occurred on 22 February between 0700 and 0800, when 70 microearthquakes were recorded on the seismometer less than 1 km from the dome, 2 hours before USGS scientists flew over the volcano and reported active degassing (see below). Since the end of February, seismicity has intensified, with concentrated swarms (3-4 events/hour lasting 1-2 hours) occurring approximately twice a day. These microearthquakes were all shallow and indicate fracturing and degassing of the dome. The following is a report from M.E. Yount. "On 17 February, James Riehle saw what he believed to be an explosion plume over Augustine Volcano, while on Wolverine Peak more than 300 km from Augustine. The plume rose to an estimated altitude of more than 3 km. It was dispersed by winds within ~0.5 hour, with the lower portion of the plume drifting W or NW and the upper portion drifting E or SE. Seismic recorders at the USGS office in Anchorage, which monitor some of the University of Alaska Geophysical Institute seismometers, had shown an increase in small events near Augustine, beginning 13 February. On 20 and 21 February, the USGS began receiving reports from observers in Homer (110 km NE of Augustine) and from pilots flying near the volcano that it was vigorously steaming. "On 22 February, USGS personnel flew over the volcano and confirmed that it was actively degassing from the moat around the summit dome. The main fumarolic vent was in the moat E of the dome. During the observations (between 1000 and 1018), fumarolic activity was continuous and steady. The plume was whitish, with a few grayish wisps. The SE and W sectors of the snow-covered cone were lightly dusted with ash, believed to be comminuted portions of the 1976 dome. No sign of avalanches or falling blocks from the dome were observed. During a 28 February overflight, USGS personnel noted an increase in the amount and area of fumarolic activity compared to 22 February. Augustine may be following its traditional pattern of slowly forcing the summit dome up followed by dome destruction and pyroclastic flow activity." On 14 March, images from the NOAA-9 polar orbiting satellite showed a plume extending ~50 km S from Augustine at 1413 and 1555. No plume had been visible on 13 March, and clouds obscured the area 15-17 March. USGS scientists also flew over the volcano on 14 March, noting that the plume rose ~1,000 m above the summit and looked similar to the plume seen during their overflight on 28 February. Information Contacts: Juergen Kienle, Geophysical Institute, University of Alaska, Fairbanks; M.E. Yount, T. Miller, and James Riehle, USGS Anchorage; M. Matson, NOAA/NESDIS. A series of powerful explosions 27-31 March sent eruption clouds into the stratosphere and generated pyroclastic flows that reached the sea. Ash was deposited over a wide area and international air traffic was disrupted. M.E. Yount reports that "Augustine began to erupt during the early morning of 27 March. Observers in fishing boats 55 km SE of the volcano and ashore in Homer, 110 km ENE, reported 'orange flashes' of light and 'smoke and fire' from the volcano between 0200 and 0528. A strong sulfur smell was reported from Homer to Kenai (175 km NE of Augustine). The leading edge of the main plume moved up the E side of Cook Inlet, depositing an estimated 1.5 cm of ash on Kenai and dusting the Anchorage area (260 km NE of the volcano). Numerous major eruptive events with column heights estimated at 9.1-12.2 km punctuated a continuous eruptive plume of varying ash content (figures 1 and 2). Major bursts were recorded at 1023, 1545, 1646, and 1724. During 27 March several lahars were generated on the S flank of the volcano, and pyroclastic flow activity was reported. Figure 1. Oblique airphoto of Augustine from the south on 27 March 1986, showing the eruption column extending and deposits on the upper flanks. Steam can be seen rising from the margins of the summit crater and from other areas where groundwater has been heated by the eruption. Courtesy of USGS; photo by M.E. Yount. Figure 2. LANDSAT image (number 5075620463) of Augustine on 27 March at 1146, showing a vigorous vertical eruption column and pyroclastic flow deposits. Image courtesy of John Power, Geophysical Institute, University of Alaska. "Similar eruptive behavior continued through the next day, with column heights generally estimated at 6.1-7.6 km, and perhaps as high as 14.3 km at 1533. Pyroclastic flows down the N flank . . . accompanied these bursts. Most were of insufficient volume or speed to reach the sea. On 29 and 30 March, a continuous eruptive plume with varying ash content rose to elevations of 3-4.5 km; eruptive events with high ash columns were less frequent than on 27 March. During periods of high plume ash content, pyroclastic flows were spilling from the summit vent area at a rate of one every 4-10 minutes (figure 3). As before, most did not reach the sea. Figure 3. Oblique airphoto of Augustine's upper N flank on 30 March 1986, showing a pyroclastic flow advancing down the near flank. The ascending eruption column moving away to the SE casts a strong shadow to the W (right). Courtesy of USGS; photo by M.E. Yount. "The final major eruptive ash column was recorded on 31 March at 0952 with an estimated height of 11.6-12.2 km. 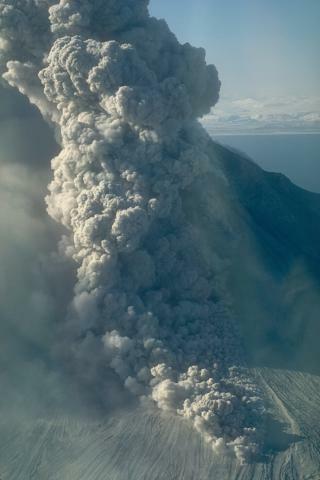 This burst was accompanied by large pyroclastic flows which entered the sea (on both sides of the University of Alaska Geophysical Institute's Burr Point Cabin on the N side of the island) generating billowing white plumes to 1.5 km as they reached the water. Both seismicity and ash content of the plume tapered off after 31 March. "Air traffic was disrupted at Anchorage International Airport, a major transportation hub, for several days because of ash clouds in the area. On 29 March, a Sabena Airlines DC-10 suffered significant abrasion of windshield and turbine parts while descending to Anchorage airport in near zero visibility conditions caused by ash in the atmosphere. Businesses and offices in Anchorage closed early on 27 March after requests from the utility company to curtail electrical usage because of potential shutdowns of turbine generators. Postal service was disrupted. An air quality health alert was in effect on 28 March due to high particulate concentrations." On 3 April at about noon, COSPEC measurements by William Rose from a fixed wing aircraft indicated that SO2 emission was occurring at a rate of about 24,000 t/d, probably a significantly lower rate than during earlier more vigorous activity. Calculations based on COSPEC measurements the previous afternoon suggested that roughly 70,000 metric tons of SO2 may have been present between 1.5 and 4.5 km altitude, within a circular area (about 250 km diameter) extending between Anchorage and Augustine. SO2 from eruptions on 27 and 31 March was detected by the TOMS instrument of the Nimbus-7 satellite. Total SO2 content was significant, but its magnitude has not yet been determined. Many images from the NOAA 6 and 9 polar orbiting weather satellites showed plumes, extending as much as 450 km from Augustine. NOAA scientists estimated possible plume heights by comparing radiosonde data on wind directions at various altitudes with directions of plume movement observed on satellite images (table 1). Estimates ranged to 24 km, but elevations often could not be determined uniquely because of similar wind patterns at different altitudes. Infrared imagery generally showed a hot spot over the volcano, where heat saturated the temperature sensors. Table 1. Dimensions of plumes from Augustine, 27 March-6 April 1986, derived from polar-orbiting weather satellite images. Plume heights are estimated by comparing wind data collected at known altitudes by nearby radiosondes with observed directions of plume movement. Multiple altitude estimates are given when plume behavior correlated with similar wind patterns at more than one elevation. After a substantial increase in the number of earthquakes on 25 March (figure 4), seismic data indicated that the eruption began at about midnight 26/27 March. On the 27th, the island's five seismic stations recorded intense high-frequency shallow seismicity. Superimposed pulses that saturated the instruments for several-minute periods were believed to be associated with eruptive bursts. Figure 4. Number of seismic events/day at Augustine, 20 February-26 March 1986. Courtesy of John Power, University of Alaska. On 28 March, larger seismic events (M > 2) began to be recorded at stations 40 and 80 km from Augustine (figure 5). These occurred during periods of increased seismic intensity at island stations and were associated with reports of ash bursts. Seismicity continued with variable intensity over the next few days. Seismometers on the N side of the island sensed more activity than those on the other flanks, presumably indicating passage of pyroclastic flows down that side of the volcano. Figure 5. Cumulative seismic moment of explosion earthquakes vs time, 28 March-4 April (top); and magnitudes vs time, as recorded by a University of Alaska seismic station 23 km N of the volcano, 28 March-10 April (bottom). As of 16 April, no significant events had been recorded at that station since 4 April. Times and dates are GMT. Plot courtesy of Elliot Endo. On 31 March, a large seismic event, associated with the last major ash explosion, began at 0955 and lasted approximately 15 minutes. The signal contained three major pulses and had an average magnitude of 2.75. Seismicity was quiet for a day, then resumed briefly before ceasing to be recorded at seismometers 28 km away (figure 6). Figure 6. Map showing epicenters of the 19 best-located events 25 March-2 April. Hypocenters 0-0.5 km below the summit are shown by asterisks, 0.5-1 km by octagons, and 1-5 km by squares. The five seismometer stations are shown by solid triangles. Courtesy of Charlotte Rowe, University of Alaska. 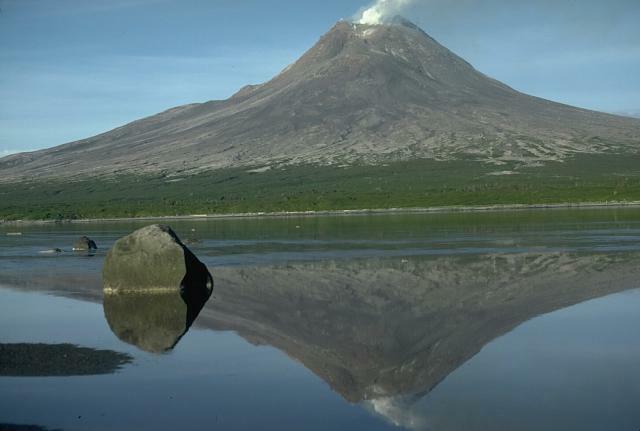 During the first week of April, poor weather conditions precluded systematic observation of the volcano, but continuous seismicity indicated that a continuous plume, carrying variable amounts of ash, was being emitted from the volcano. During an overflight on 2 April, pyroclastic flows were observed advancing down the N side of the volcano. On 3 April an airplane pilot reported a plume to 3 km. During an overflight on 6 April, "boil-over" type pyroclastic flows were being emitted from the volcano. During the same day, from separate aircraft, Juergen Kienle and USGS scientists were able to make their first good observation of the summit. They both noted that most of the 1976 dome was still intact, with some loss on the S side. There were no signs of a new dome. On 10 April, Kienle noted that: 1) A virtually continuous plume containing variable amounts of ash had been emitted from the summit since the eruption's onset. 2) No coarse (subplinian) deposits had been seen during overflights. Sampling on the island had been impossible, but fine brown ash appeared to cover the entire island. 3) Scanning electron micrographs of ash collected in Anchorage on 28 March and in Homer following the 31 March explosion show blocky textures typical of phreatomagmatic eruptions. 4) All earthquakes have been located at approximately sea level (figure 6). 5) Most of the 1976 dome is still in place. These data suggested to Kienle that only phreatic or phreatomagmatic activity had occurred, produced by dike injection to approximately sea level, where magma came into contact with the water table. Tom Gosink reports that preliminary chemical analysis of ash shows that low-sulfur, high-silica, andesitic material was ejected from the 28 March eruption (table 2). The 2 April eruption was distinctly richer in silica, particularly the fine (3, up to 1,500 ppm, were measured, associated almost exclusively with the fine particles. Lead was detected to only 10 ppm concentrations in all of the ash except the 2 April fine material, in which more than 80 ppm was measured. Rb/Sr is 0.07 for the 28 March bulk sample and 0.10 for the 2 April fine material. Table 2. Analyses of 1986 Augustine ash, by energy dispersive X-ray fluorescence at the University of Alaska, showing changes with time and particle size. 28 March: bulk sample of ash collected in Anchorage; 2 April: fine (<38 µm) fraction of ash collected in Homer. * Total iron expressed as Fe2O3. Information Contacts: J. Kienle, Tom Gosink, John Davies, John Power, David Stone, Chris Nye, Larry Gedney, and Charlotte Rowe, Geophysical Institute, University of Alaska, Fairbanks; M.E. Yount and T. Miller, USGS Anchorage; W. Rose, Los Alamos National Laboratory; Elliot Endo and Michael Doukas, CVO; M. Matson, G. Stephens, and O. Karst, NOAA/NESDIS; A. Krueger, GSFC. M.E. Yount and T. Miller report that "A USGS overflight of Augustine on 24 April established the presence of new lava dome material in the moat between the remnants of the 1976 dome and the SW rim of the summit crater. Hot blocks were spalling off the NW side of the new dome, avalanching down a gully on the W side of the 1976 dome. Small ash-rich fumaroles were active on the 1976 dome's entire N flank. During the flight, a burst of white vapor that lasted for several minutes appeared from the 1976 dome's NW base. Observers on a night flight 24 April, using US Army night vision goggles, were able to see incandescent material all around the 1976 dome. Although the summit was obscured on 25 April, observers were able to see a blocky flow in the chute on the 1976 dome's E side. On 27 April it was apparent that the lava flow originated from the summit crater, draping the E side of the 1976 dome. Small pyroclastic flows were observed that day on the 1976 dome's NW side. Samples collected on 28 April from the toe of the lava flow are silicic andesite, as are breadcrusted pumiceous material from the pyroclastic flows. By 6 May, the flow had descended to an elevation of ~600 m through the breached N side of the crater. Seismicity indicated that the dome was actively building between approximately 22 April and the late evening of 28 April, when the almost constant tremor abruptly died out." [The onset of dome growth is given by Swanson and Kienle (1988; see Further References in SEAN 11:08) as 23 April]. Juergen Kienle reports that "After the strong explosive activity that began on 27 March and ended with a major explosion on 31 March at 0952, the volcano was visited by helicopter on 19 and 28 April and 6 May. The following are preliminary results from those field investigations. Pyroclastic flows. "A 19 April Landsat 5 image clearly shows the light-colored pyroclastic flow deposits that were emplaced 27-31 March on the N flank of the volcano, covering an area of 11 km2 (figure 7). March 31 was the only day on which pyroclastic flows entered the sea, 5 km from the vent. A strong odor of Halogen gas (Cl2, possibly F2, Br2) was detected when crossing the still-steaming areas where flows had entered the sea. The flows were strongly inflated on 19 April, almost 3 weeks after emplacement. Figure 7. Landsat-5 image (no. 5077920515) of Augustine on 19 April. Pyroclastic flows erupted 31 March onto the N flank are outlined in black. Points 1 and 2 mark stations where temperature measurements were taken. The distance from the summit to the shore at point 2 is 5.0 km. "With every step we (Kienle, Miller, Power) took, we sank up to our knees into the still hot fluidized flow tops. Temperatures measured at depths of 5 cm in active fumarole pipes and fissures (which were actively elutriating fines) on the NW and NE flow lobes were 550°C (at location 1) and 339°C (at location 2) (figure 7). Driftwood on the beach was charred; one log was charcoaled, indicating that it had caught on fire. The NW flow lobe had buried a former fresh-water lake and a brackish-water swamp area. In that area we noted several small phreatic explosion craters, about 10 m in diameter. 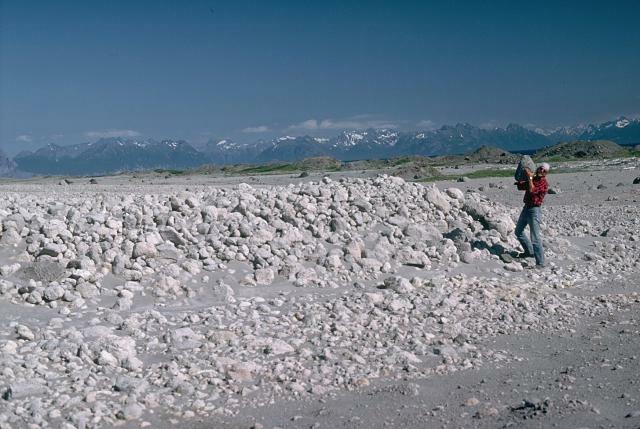 "Levee-forming pumice blocks were typically up to 50 cm in diameter with rounded edges. There were rare banded pumices and occasional breadcrusted blocks. Individual flow units were about 3-5 m thick. The bulk chemistry of one of the breadcrusted blocks is given in table 3 (sample 4). Table 3. X-ray fluorescence analyses of Augustine's 1986 eruptive products (normalized to 100% anhydrous) by Christopher Nye. * Total iron expressed as Fe2O3 (FeO = 0.9 x Fe2O3). "A crude estimate of the 31 March pyroclastic flow volume can be obtained by assuming an average thickness of the flows of 10 m (we estimate about 8 m for the lower half of the pumice plain and in excess of 20 m for the upper part of the flow fan just below "Hells Gate," near the S end of the area outlined in black in figure 7. Using 11 km2 we obtain 0.11 km3 of inflated ejecta. Seismicity. "Since 4 April, when violent explosive activity subsided, we have not registered explosion earthquakes at seismic station OPT, 28 km N of the volcano. Individual locatable earthquakes are now rarely recorded. Figure 8 shows a count of individual pyroclastic flows (or rock avalanches) 31 March-10 May. The plot thus essentially shows periods of intense dome deformation. Figure 9 shows one of the avalanches that would have been counted, descending the N flank of the volcano to about the 750 m level. It was photographed from our N flank seismic station 2 km from the vent on 19 April at 1411. That station was damaged and a solar panel was incinerated by a hot blast associated with pyroclastic flow activity on 31 March. Parts of the installation protruding above ground (antennas, masts, and solar panel) were pockmarked with dents from flying rock. Fortunately the buried electronics box and batteries were not damaged and the station has continued to operate uninterruptedly up to 10 May. Significant avalanche activity was observed 20 April-10 May, a period of strong dome transformation. Figure 10 is a hypocentral cross section for events occurring 27 March-27 April. The plot shows that most earthquakes occurred in the upper 2 km of the volcano. Figure 8. Number of pyroclastic flows and rock avalanches recorded at the flank seismic station 3 km from the summit. Counted events had amplitudes larger than 5 mm on that seismometer's record. Figure 9. Pyroclastic flow, 19 April at 1411, photographed by Juergen Kienle from 3 km N of the summit. Figure 10. Cross-section showing depths of local earthquakes 27 March-April. Plot by Charlotte Rowe. "A seismic curiosity: On 28-29 April and 3-6 May, we recorded thousands of small earthquakes with nearly identical wave forms and magnitudes. Scaling of the time interval between events for a 15-minute period showed a periodicity of 12 ± 2 seconds (77 events). Figure 11 is a digital playback for 3 individual events showing their great similarity. The events occur at the central conduit of the volcano at ~750 m elevation (near station AUH). We speculate that they are produced by meltwater contacting the central glowing conduit and flashing the water rhythmically to steam. On 6 May, Tom Miller thought that he could see puffing of the eruption column in spite of the strong winds that drove the plume down to the shore. He also noted that new snow had fallen and was melting. Figure 11. Three nearly identical wavetrains of rhythmic events recorded on 5 May at a seismic station less than 1 km NW of the summit. Dome growth. "The 1976 dome was never cleared out in any individual explosion, but was slowly transformed into a new dome by magma intrusions and extrusions starting 31 March. As of 6 May its height was 460 m with a base diameter of 400 m and a volume of about 0.06 km3 (figure 12). Its surface was blocky and spiny. An active vent was located in the SSW corner of the crater, a source of numerous boil-over pyroclastic flows. Slabs of glowing rock frequently spilled off the N face of the dome as seen by Kienle on 28 April. Figure 12. New dome photographed from the N on 6 May by Juergen Kienle. Chemistry. Five XRF chemical analyses of 1986 ejecta are listed in table 3. The bulk chemistry shows an interesting trend toward less silicic magma as the eruption proceeded. Ballistic bombs collected on 19 April on the S flank (near Bench Mark Kamishaki sample 3) and a breadcrust block (sample 4) collected from the NE lobe of the pyroclastic flows are believed to have been ejected on 31 March. They are very similar in chemistry, showing about 62% SiO2 content. In contrast, the new dome rock collected on 28 April by Tom Miller shows a more basic bulk chemistry with an SiO2 content of about 60%, suggesting the tapping of deeper levels in the magma chamber (less than 2 km deep, based on the seismic data). The high SiO2 content (64.5% and 65.6%) of the distal tephras from the 28 and 31 March eruptions probably reflect aeolian fractionation. Summary. 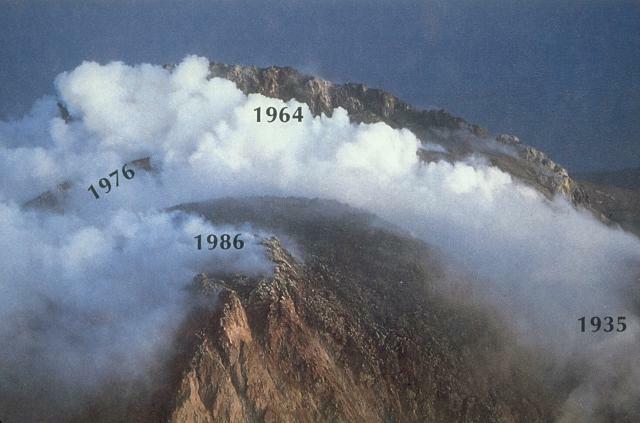 The 1986 eruption of Augustine has thus far followed a quite different course from the 1976 eruption, which began with a violent vent-clearing phase, followed by a 14-day repose, in turn followed by intrusion of a new dome. During the present eruption, a vent-clearing phase never occurred. The pre-existing dome was slowly transformed into a new dome. March 31 was the only day of substantial production of highly vesiculated magma, ejected as large blocks on all flanks of the volcano but predominantly as pyroclastic flows down the N flank. There are no sub-plinian pumice fall deposits on the island. A pathway for the vesiculating material was probably eroded out of the pre-existing conduit (the 1976 dome) on 31 March. This open conduit continues to produce occasional small-volume pyroclastic flows and was the source of the peculiar "percolator-like" seismicity described above, as meltwater interacted with new hot conduit rock. The most remarkable feature of the 1986 eruption thus far is how well lithostatic pressure has confined the eruption, which was never particularly violent in spite of the fact that the beginning phase shows clear evidence of phreato-magmatic processes due to the interaction of ground water near sea level with the rising magma. If any of the pre-existing structures (1935 dome, 1964 dome, or 1976 dome) had collapsed catastrophically, the unloading would have very likely produced much more violent activity." Information Contacts: J. Kienle, C. Rowe, J. Power, and L. Gedney, Geophysical Institute, University of Alaska, Fairbanks; C. Nye and J. Davies, Alaska Division of Geological and Geophysical Surveys, Fairbanks; M.E. Yount and Tom Miller, Branch of Alaskan Geology, USGS Anchorage. Following the extrusion of its new dome between  and 28 April, activity at Augustine decreased rapidly. As of 7 June, a variable steam plume carrying small amounts of ash was still being emitted from the summit, occasionally to 3 km altitude. Scientists on the island 6 and 7 June noted an intense sulfur odor in the plume and a strong halogen smell on the pyroclastic flows. They measured a temperature of 400°C at a depth of 30 cm in a pyroclastic flow on the volcano's N flank. As of 11 June, tens of individual earthquakes were being recorded daily by the seismometer on the N flank of the volcano, indicating brittle fracturing of the cooling dome. Information Contacts: J. Kienle, Geophysical Institute, University of Alaska, Fairbanks; M.E. Yount, Branch of Alaskan Geology, USGS Anchorage. Active degassing of Augustine continued following the major dome extrusion phase of 23-28 April. During field studies from late June through mid-July, no major changes were noted in the morphology of the new dome, although slow dome growth appeared to be continuing as seen by occasional dome-collapse pyroclastic flows and incandescent rockfalls. Merapi-type pyroclastic flows extending 1-2 km down the N flank were observed in late evening on 26 June, around noon 1 July, and at 2123 on 17 July. Inspection of seismic records suggested that they occurred on other occasions as well. A coarse debris flow, 1-2 m thick at its terminus, was observed on 2 July and was probably emplaced during a rainstorm the previous night. It stopped 2 km from the summit within the axial levees of the NW pyroclastic flow. The terminus of the blocky 1986 lava flow (figure 13) appeared to be at the same elevation (~600 m) as on 6 May. Active fumaroles covered much of its surface, and incandescent cracks were observed. Figure 13. Annotated telephoto view of Augustine from the N on 14 July 1986. Portions of the area labeled "1986 Dome" may be remnants of the 1976 dome. Fumaroles obscure the E margin of the 1986 dome; remnants of the 1976 and 1964 domes on the S side of the summit crater are not visible in this view. Courtesy of Lee Siebert, SI. Intense fuming prevented ground observations of the dome while geologists were at the summit, but an overflight confirmed that the 1986 dome was emplaced within a crater in a remnant of the 1976 dome. The top of the new dome was lower than the crescent-shaped remnant of the 1964 dome on the S side of the crater, and was roughly comparable to the elevation of the 1935 dome remnant on the NW side. The most vigorous fuming originated from vents in the moat between the new dome and a ramp below the 1964 dome. Maximum gas temperatures measured by Bob Symonds at summit crater fumaroles were 625-645°C. Fumarole condensates had a pH of between 0 and 0.5. Measured fumarole temperatures on 1986 pyroclastic flow deposits on the N flank varied from about 200 to 250°C; pH values ranged from 0 to 1. During an overflight on 24 July at about noon, COSPEC measurements by Symonds indicated that the SO2 flux of the plume was 380 ± 45 t/d, a value comparable to that observed at Mt. St. Helens in December 1980. Heat flow measurements from steel pipes inserted in the pyroclastic flows recorded a maximum temperature of 525°C at 6.16 m depth on the NW flow on 12 July. An adjacent hole showed isothermal convection at the boiling point for the upper 1.20 m and apparently penetrated through the flow, producing a reverse temperature gradient (figure 14). NE flow holes encountered large lithic blocks at shallow depths; 3l5°C temperatures were measured at the maximum depth of 2.58 m on 16 July. Figure 14. Temperature profiles from NW (top) and NE (bottom) pyroclastic flow lobes. The data were obtained from just NW of point 1 and at point 2, respectively, of figure 7. Note that both depth and temperature scales are different. Courtesy of Juergen Kienle. Since 10 May the daily number of rockfall avalanches or Merapi-type pyroclastic flows declined to about a half dozen/day (see 11:04 for pre- 10 May data). A modest increase in daily events to 30-40/day was noted beginning 13-14 August. At press time continuous noise on seismic records from 0006 to 0200 on 20 August indicated that an explosive eruption had taken place. Pilots reported ash and steam emission that afternoon and noted new pyroclastic flows extending 3/4 of the way down the N and NE flanks. Information Contacts: J. Kienle and Tony Limke, Geophysical Institute, University of Alaska, Fairbanks; Robert Symonds, Michigan Technological Univ; Lee Siebert, SI. The following is from Juergen Kienle. "Augustine was in moderate eruption from about 19-31 August. Renewed dome growth resulted in intense pyroclastic flow activity and plumes rose to 2,500-3,000 m. On 28 August, Maurice and Katia Krafft and Juergen Kienle observed many pyroclastic flows at close range. Incandescent samples of a newly extruded spine were collected by Tom Miller and Kienle on 11 September. The following is a summary of preliminary field observations. Observations from overflights and fishing boats. "Bill DeCreft, a local bush pilot, reported ash in the air during the evening of 19 August, with unusually pink sunsets. The onset of activity coincided with the full moon, the peak range of the fortnightly earth and ocean tides. On 20 August, DeCreft observed two new pyroclastic flow lobes extending 3/4 of the way down the N and NE flanks. Light brown dust was trailing SE to Cape Douglas, 50 km away. Other pilots reported plumes to 3000 m. That evening (2030-2100), the crew of a fishing boat NW of the volcano observed incandescent pyroclastic flows descending the northern flanks of the volcano. At noon the next day, Tom Miller overflew the mountain and reported very modest ash emissions to a few hundred meters above the vent. "Poor weather prevented observations 22-23 August, when ash and muddy rain fell at Homer, 100 km to the E. Glow was seen from a fishing boat on 25 August. Miller overflew the volcano again 27-28 August, observing pyroclastic flows and small eruption clouds that rose to 1,000-2,000 m above the volcano. The summit was partially obscured by orographic clouds. Seismicity. "Figure 15 shows daily surface events (pyroclastic flow counts) and earthquakes (M > 0.25), March-September 1986. Earthquake activity had declined dramatically since the end of the major 27 March-early May eruptive phase. From May through August, seismicity has been very low; we typically recorded fewer than 5 events/day, occasionally up to 20/day. No buildup of seismicity preceded the present dome growth episode. However, it should be noted that during periods of intense avalanching or pyroclastic flow activity, the seismic background noise is so high that we cannot recognize individual microearthquakes. Figure 15. Number of surface events, rock avalanches and pyroclastic flows, with durations greater than 1 minute (top) and the number of earthquakes/day, ML > 0.25 (bottom) recorded at Augustine station AUH, 800 m horizontally from the vent. The surface events plot has a saturation level set at 50 events/day. The April gap in the daily earthquake count occurred during intense surface activity, which masked individual microearthquakes. Plot by John Power. "Throughout the summer, Merapi-type pyroclastic flows or rockfall avalanches occurred at a rate of less than 10/day. Starting on 13-14 August, we noticed a decided increase in surface events, with more than 50 events counted daily between 21 and 31 August. As of 13 September, the surface event activity had declined to the low summer background level. Pyroclastic flows. "On 28 and 29 August, Maurice and Katia Krafft and Juergen Kienle visited Augustine Island. On 28 August, the ash plume reached about 2,500 m and prevailing winds carried it to uninhabited areas NW of the volcano. The entire W, N, and E slopes were heavily covered with wet ash all the way to the beach. Leaves and wildflowers were wilted brown from heavy ash accumulation and passage of SO2 clouds. During the day, we managed to observe many pyroclastic flows at close range; figure 16 shows one descending the N flank around noon. Usually, pyroclastic flow activity followed intense rock avalanches high on the dome. Unfortunately, the dome was obscured by clouds and we could not see the rockfalls but they were distinctly audible. On one occasion, we clearly felt a strong pressure pulse preceding the emergence of a pyroclastic flow from under the clouds. The pulse followed intense rockfall activity. We interpret the pressure pulse as a vesiculation event on the dome when fresh magma became exposed at the surface after a rock avalanche. The pyroclastic flows essentially free-fall off the very steep dome. At Hell's Gate (at the base of the 1,500-m-high dome, 1,500 m horizontally from the source) speed was 40 m/s (observation by Maurice Krafft). Farther downslope, the flows decelerated rapidly and stopped at about 250 m altitude, 2.2 km horizontal distance from the source. There were 2 principal avalanche tracks down the northern flanks. Figure 16. Pyroclastic flow at the 350 m level on the N flank of Augustine, 28 August 1986. The flow probably originated at the base of the spine near the summit (about 1,200 m level). At the moment shown, the flow had decelerated to about 20 m/s. No glow was observed in the flow, and its travel down the mountain was soundless to nearby witnesses. Foreground blocks are about 1 m in diameter. Photo by Juergen Kienle. "We were able to verify several of Frank Perret's important observations on pyroclastic flows (from Mt. Pelee in 1929-32). "1. The pyroclastic flows moved in silence, unheard even from very close range (50-200 m). This is in striking contrast to the loud rattle of rock avalanches high on the dome that preceded the pyroclastic flows. Sounds of the colliding blocks within the pyroclastic flow avalanche are apparently muffled by the elutriating fine ash. "2. The Kraffts observed purple lightning flashes in the nuées but did not hear any thunderclaps. The compactness of the cauliflower cloud and observed lightning flashes lend credence to Perret's hypothesis that the dense clouds may be held together electrostatically (opposite charges of steam and ash). "3. The basal avalanche below the rolling cauliflower clouds moved in spurts. Its thickness was probably less than a few meters. "4. Forward-springing jets composed of relatively fine sand-sized material were clearly observed by Kienle at the snout of the avalanche. Jets or narrow sheets of this material emerged from the top surface of the moving basal avalanche and were thrown diagonally downwards ahead of the moving flow, immediately to be overrun by the following avalanche, suggesting that a retrograde rotor turbulence was operating at the flow front. "5. Occasionally, the basal avalanche would override and entrap a pocket of cold air behind an obstacle such as large rocks. Heating and expansion of the entrapped air caused sudden boils in the moving avalanche seconds later. "6. Meter-sized pumice blocks were seen emerging continuously from the flanks of the flows, leaving beautiful levees on the sides of the pyroclastic flow channels. "7. Where we observed the flows, they were eroding, leaving U-shaped channels 10-30 m wide with 2-m-high pumice levees on both sides. Some flows also left one or more central furrows. This suggests that longitudinal turbulent rolling motions occur within the pyroclastic flows. However, we could not observe this from our viewpoint to one side of the flows. "8. We did not notice any indraft adjacent to the pyroclastic flows, nor any incandescence, even at night, probably because they were relatively small. "9. Individual flows left a hot inflated gray fine ash deposit about 50 cm thick where we studied it at the 350 m level. 10. Larger pyroclastic flows on 28 August resulted in sand-sized ashfalls to the shoreline on the N and NW flanks. A large cloud produced by two merging pyroclastic flows passed overhead at the Burr Point camp (6 km N of the summit) at 1935, showering sand-sized particles on us for about 5 minutes. The sand was not hot. Dome growth. "Although we have no geodetic data, clear changes have taken place at the summit of the dome during this most recent eruptive episode. Miller and Kienle visited the crater on 11 September. A new spine, about 10 m high, occupied the small crater that had existed on top of the dome during the summer. Concentric ring fractures and alternating circles of moats and arches attest to endogenous dome growth and final extrusion of a spine above the central magma stem. New material was also added to the N face of the dome since we had last seen it on 17 July. Temperatures of March-April pyroclastic flows. "These flows have cooled substantially since mid-July, when we recorded a maximum temperature of 525°C at 6.16 m depth on the NW flows. On 11 September, that hole had cooled to a maximum temperature of 270°C encountered at 4.55 m depth. Cooling is now taking place from the bottom and top of the deposits, with a temperature reversal below 4.55 m."
Further References. Rose, W.I., Heiken, G., Wohletz, K., Eppler, D., Barr, S., Miller, T., Chuan, R., and Symonds, R., 1988, Direct rate measurements of eruption plumes at Augustine volcano: a problem of scaling and uncontrolled variables: JGR, v. 93, no. B5, p. 4485-4499. Swanson, S.E., and Kienle, J., 1988, The 1986 eruption of Mount St. Augustine: field test of a hazard evaluation: JGR, v. 93, no. B5, p. 4500-4520. Yount, M.E., Miller, T.P., and Gamble, B.M., 1987, The 1986 eruption of Augustine volcano, Alaska: hazards and effects, in Hamilton, T.D. and Galloway, J.P., eds., Geologic studies in Alaska by the USGS during 1986: USGS Circular 998, p. 4-13. Information Contacts: J. Kienle and J. Power, Geophysical Institute, University of Alaska, Fairbanks; Maurice Krafft and Katia Krafft, Centre de Vulcanologie Vulcain, France; T. Miller, Branch of Alaskan Geology, USGS Anchorage. At 1405 on 30 July, MarkAir pilots Kriss Paull and Bruce Gorham observed larger than normal steam emission from Augustine. When first observed, the plume was described as dirty steam with dark streaks at 1600 to 1800 m altitude, but it rose to about 2,700-3,000 m altitude within several minutes. At 1530, on their return from Kodiak to Anchorage, the pilots observed the plume spreading E and topping out slightly higher than 3600 m altitude. The volcano has emitted steam continuously since its 1986 eruption. Less than 4 minutes before the plume was first observed, an earthquake with an epicenter of 60.0°N, 153.5°W (about 75 km NW of the volcano) was felt in the lower Cook inlet region. The event occurred at 1401:29 and was located by the Alaska Tsunami Warning Center at a depth of 169 km with a local magnitude of 4.1. The University of Alaska Geophysical Institute seismic network detected two Augustine earthquakes at about 1603 and 1621 with above-normal magnitudes (about 1). Geologists returned to Augustine in July 1989 for additional monitoring of magnetic changes, deformation, and fumarolic activity. The following is from the Alaska Volcano Observatory. Magnetic data (Dan Dzurisin). David Schneider and John Power remeasured a 25-point N-S magnetic profile across the 1986 lava dome. Little change had occurred since the previous measurement in June 1988, although similar measurements on the Mt. St. Helens dome indicated that its Curie Point isotherm migrated inward at a rate of 3 ± 1 cm/day from 1984 to 1986. Geologists suggested that the proximity of a relatively active magmatic system at Augustine may retard cooling of the 1986 dome, or that differing rock magnetic properties may account for apparent differences in cooling rates. Deformation (Gene Iwatsubo and John Power). The deformation network established in June 1988 was reoccupied in early July 1989, and several additional EDM lines were added. Preliminary data showed no significant changes in the lengths of pre-existing lines, indicating that no deformation was occurring to the cone and summit dome complex. Gas measurements (Robert Symonds and Robert Andres). July 1989 fieldwork indicated that fumarolic activity had decreased significantly since the previous gas measurements in August 1987. Maximum temperatures at a fumarole field on the 1986 lava dome had dropped to 640°C on 6 July 1989 from 870° on 28 August 1987. A condensate sample from the 640° fumarole had a magmatic isotopic signature (delta D = -36, delta 18O = +8.8) and a higher Cl/SO4 weight ratio of 19 (16,000 ppm Cl, 840 ppm SO4) compared to Cl/SO4 ratios of 8.7-9.6 from the same fumarole field in August 1987. Geologists noted that the lower temperatures and higher Cl/SO4 ratio (due mostly to a lower SO4 content) suggest that the magma supply has become more degassed since 1987. Estimated SO2 emission rates of 72 ± 14 metric tons/day (t/d) on 10 July 1989 were slightly higher than 1987 values (45 ± 7 t/d on 24 May, 27 ± 6 t/d on 24 August), but uncertainty in estimated wind speed made comparisons ambiguous. Information Contacts: Daniel Dzurisin and Eugene Iwatsubo, USGS CVO; J. Power, Geophysical Institute, University of Alaska, Fairbanks; Robert Symonds and Robert Andres, Michigan Technological Univ. This report covers events from May 2005 through 26 January 2006. The first substantial ash-bearing eruption took place on 11 January; another one, on 17 January, rose to ~ 13.7 km. By late January there had been eight eruptions. A National Oceanic and Atmospheric Administration (NOAA) message pointed out that life-threatening costly damages can occur to aircraft that fly through an eruption cloud. It added that the Federal Aviation Administration put NOAA's information to work, giving air traffic managers and controllers a heads-up to ensure airspace safety around the volcano as well as along the forecast trajectory of the ash plumes. Augustine eruptions had also automatically alerted the West Coast and Alaska Tsunami Warning Center. The geography of the Cook Inlet, where Augustine is located, is shown on figure 17. Figure 17. Map showing Augustine in its relation to nearby volcanoes, Cook Inlet, and surrounding communities. Courtesy of Janet Schaefer and AVO / Alaska Division of Geological & Geophysical Surveys. 1985-89 crisis and eruption. 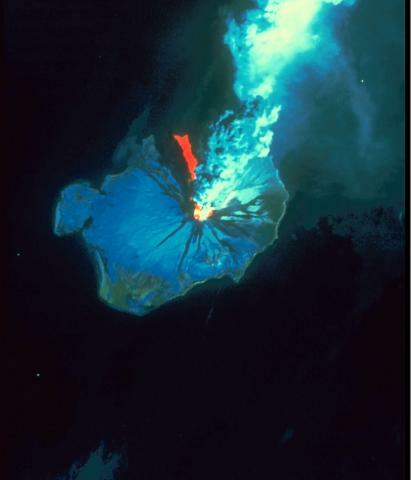 The last major eruption of Augustine was in March 1986. Between mid-July and early August 1985, seismicity at Augustine began to increase. From then until late February 1986, recorded earthquakes averaged 12/day, with occasional short bursts of seismicity. On 17 February 1986 an explosion plume was observed over the volcano. Seismicity intensified after the end of February. On 27 March 1986 explosions sent eruption clouds into the stratosphere and generated pyroclastic flows that reached the sea. Ash was deposited over a wide area and international air traffic was disrupted. 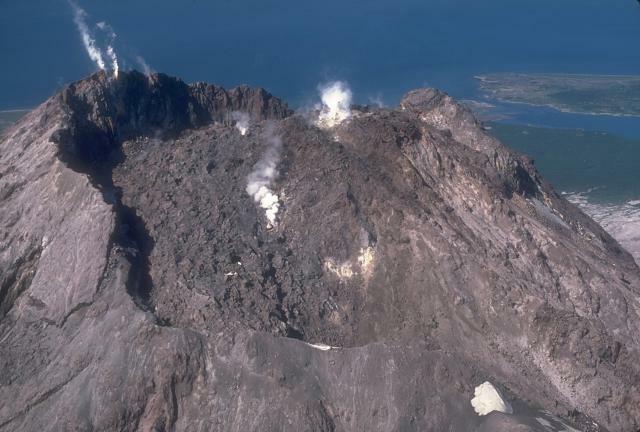 Explosive activity, ash plumes, and pyroclastic flows continued through August and September 1986, and Augustine steamed continuously through at least July 1989 (BGVN11:02-11:08, 13:07, 14:09). Current eruption.This report is chiefly based on the continuing coverage of the Augustine eruption by the Alaska Volcano Observatory (AVO). The AVO website presents observations and remarkable photos documenting eruptive stages seen thus far. Beginning in May 2005, there was a slow increase in the number of earthquakes under Augustine. The earthquakes were generally small (less than M 1) and concentrated roughly 1 km below the volcano's summit. These earthquakes slowly increased from 4-8 per day to 20-35 per day. Data from a Global Positioning System (GPS) network on Augustine indicated that a slow, steady inflation of the volcano started in mid-summer 2005, continuing until the present. The GPS benchmark located nearest the summit moved a total of 2.5 cm. This motion is consistent with a source of inflation or pressure change centered under the volcano. This was the first such deformation detected at Augustine since measurements began just prior to the 1986 eruption. On 29 November 2005 AVO raised the Concern Color Code from Green to Yellow after recording important long-term changes in seismicity and ground deformation consistent with renewed volcanic unrest. There were no indications that an eruption was imminent or certain. Seismicity remained at elevated levels during 30 November to 12 December 2005. During 9-12 December, changes in the style of earthquake activity at the volcano were recorded, and there were reports of gas emissions and steaming. Seismic events on 9 and 11 December may have perturbed the hydrothermal system, initiating steam explosions. These seismic events were consistent with reports of steaming at the summit observed on 10 December, and reports of a distinct sulfur smell ("like from a sewer") in the air on the evening of 11 December at Nanwalek and Port Graham, ~ 80 km E of the volcano. Augustine remained at Concern Color Code Yellow. On 12 December a steam plume visible on video and satellite images extended 75 km SE (figure 18). Figure 18. On 12 December 2005, a plume of volcanic gas and steam billowed from Augustine and spread ~ 80 km SE. This image was captured the same day by the Moderate Resolution Imaging Spectroradiometer (MODIS) onboard the Aqua satellite. In this image, the volcanic plume streams from the tiny, snow-capped volcanic island where Augustine is located and dissipates over the ocean. NASA image created by Jesse Allen, Earth Observatory, using data obtained courtesy of the MODIS Rapid Response team. During a 12 December flyover, AVO scientists saw profuse steaming from numerous summit fumaroles, emanating mainly from behind the 1986 lava dome. Several energetic fumaroles were also located 200 m down the SE flank. A gas-and-steam plume extended 75 km SE. Augustine remained at Concern Color Code Yellow. Reports during 14-23 December mentioned that residents E of the volcano smelled sulfur; and the reports noted intervals of elevated seismicity, and several small steam explosions. A gas-measurement flight on 20 December detected SO2for the first time at Augustine since routine airborne measurements began in the early 1990s. Aerial observations and analysis of photography and video of the summit area indicated some deformation within the summit crater area. A crack or fissure was noted cutting the 1986 lava dome and extending to the SE (figure 19). Heavy steam from this feature, along with patches of bare ground, indicated an increase in the summit's heat output. Figure 19. On 20 December 2005, Augustine emitted a steam jet from a SE-flank fissure and gave off steam from its summit area. Courtesy of C.F.Waythomas and AVO / USGS. Thermal imaging of the summit area took place on 22 December, using a helicopter-mounted FLIR (Forward Looking Infrared Radiometer). The imaging confirmed the presence of a new, high-temperature fumarole or gas vent located high on Augustine's S flank. Seismicity decreased during the last week of December compared to the previous week; but steam and gas emissions continued. AVO scientists visited the volcano to install additional GPS receivers and deploy additional ash-collection devices. Observations continued to suggest that new magma was present. The level of seismicity was still well below that observed just prior to the 1986 eruption. Augustine remained at Concern Color Code Yellow. During the first week of January 2006, seismicity increased slightly compared to the previous week. The volcano continued to steam vigorously from several summit fumaroles. AVO scientists visited the volcano to install additional seismic monitoring equipment, to deploy additional ash-collection devices, and to undertake helicopter-aided thermal surveys of the summit area. The high-temperature fumarole or gas vent on Augustine's upper S flank, previously reported on for 22 December, had cooled significantly, but elevated temperatures were detected at one summit fumarole imaged through the steam and gas. Although fumarole temperatures varied, there were no significant changes in the distribution of thermal features compared to the previous survey . A gas-measurement flight detected a significant increase in SO2compared to 20 December. On 10 January 2006, AVO raised the Concern Color Code from Yellow to Orange. Earthquake activity beneath Augustine had increased markedly, indicating the heightened possibility of an explosive eruption within hours to days. On 11 January 2006, AVO raised the Concern Color Code from Orange to Red after recording two discrete explosions at the summit at 0440 and 0513. Satellite data confirmed that an ash cloud was produced and, in collaboration with the National Weather Service (NWS), the top of the cloud was estimated at 9 km altitude. NWS and AVO tracked the ash plume, which detached from the vent and drifted to the N and E. By 0740, the ash cloud had traveled 40 km E and 50 km N. An ash-fall advisory was issued by the NWS at 0644. Seismicity decreased significantly after the explosions. During an 11 January afternoon overflight, AVO scientists observed a pure white steam cloud rising to about 3.5 km altitude and drifting NE. Little volcanic ash was observed on the island itself, but volcanic mudflows were evident on the E, S, and W sides of the volcano (figure 20). A brown haze in the air was observed over the central part of Cook Inlet. Figure 20. A W-looking view of Augustine from an observation flight made after the early morning steam emission on 11 January 2006. The image shows a snow-and-rock avalanche on the SW flank (to the left) and lahars visible as gray lobes on E and N flanks (to the right). Courtesy of Stephanie Prejean and AVO / USGS. After the eruption on 11 January, seismic activity declined. On 12 January 2006 the Level of Concern Color Code was lowered from Red to Orange. Explosive eruptions on 13 and 14 January 2006 produced clouds of volcanic ash and flows of mud and rock fragments. A marked increase in seismicity early on 13 January preceded an eruption interval that began at around 0355 and ended around 0439. NWS subsequently reported ash heights of 10 km altitude. Other explosive events followed on 13 January, occurring at 0847, 1122, 1640 (figure 21) and 1858; and on 14 January at 0014 (figure 22). Each of these events produced ash plumes, mudflows, and pyroclastic flows on the island. Figure 21. This photo of a large Augustine's eruption cloud was taken between about 1645 and 1700 on 13 January 2006 from Kokhanok on the SE side of Lake Iliamna, a spot ~ 80 km W of the volcano. Image courtesy of Gerald Andrew. Figure 22. The Moderate Resolution Imaging Spectroradiometer (MODIS) flying onboard the Aqua satellite captured this image of an Augustine plume on 13 January 2006. Within a few ten's of kilometers of Augustine, a narrow steam and ash plume streams out and heads E over the ocean. Much broader zones of ash cloud dominate the middle of the image for over 100 km, both as an elongate zone to the ESE and more widely in a dispersed zone covering areas to the E and NE. In the colored image the ash clouds in the middle part of the image appear brown and white, and may well represent Augustine products in the atmosphere. NASA image created by Jesse Allen, Earth Observatory, using data obtained from the Goddard Earth Sciences DAAC (Distributed Active Archive Center). Ash clouds surpassed 9 km altitude, as reported by pilots and determined by radar data provided by the National Weather Service (NWS). Ash was carried to the E-SE and light ash falls were reported in communities of the southwestern Kenai Peninsula. According to preliminary assessment by Pavel Izbekov (Geophysical Institute, University of Alaska Fairbanks and AVO), the majority of ash particles in the 13 January seemed to be juvenile, though there are large variations in the morphology of ash particles as well as the composition of matrix glass. Enlargements of two ash grains appear in figures 23 and 24. Figure 23. SEM image of an ash particle erupted by Augustine on 13 January 2006. This is an individual plagioclase crystal. The ash sample was collected in Homer by John Paskievitch of AVO. Image courtesy of Pavel Izbekov, the University of Alaska Fairbanks, Geophysical Institute and the AVO. Figure 24. SEM image of an irregularly shaped ash particle erupted by Augustine on 13 January 2006. The ash sample was collected during the ashfall in Homer, Alaska by John Paskievitch, AVO. Image courtesy of Pavel Izbekov, the University of Alaska Fairbanks, Geophysical Institute and the AVO. On 14 January, AVO received reports from pilots of sulfurous odors and diffuse brown haze at flight altitudes when flying 400-500 km E of Augustine in SE Alaska (near Yakatat and Sitka). These diffuse ash-and-gas clouds were presumably from Augustine's explosive events on 13 January. Seismicity declined in the 30 hours after the event early on 14 January, and AVO downgraded the color code from Red to Orange. The level of seismic activity at the volcano remained above background. On 17 January 2006 an explosive eruption began at 0758 and ended at 0803. Seismic and pressure-sensor data indicated numerous small explosions, which could produce small amounts of low-level ash and could initiate small rock avalanches on the flanks. AVO raised the concern color from Orange to Red. A flight later on 17 January disclosed a brown ashy haze lingering over the island. Occasional views through the haze showed that most of the lava dome that formed following the 14 January eruption was destroyed in the explosion of 17 January. Observations made during a flight on the afternoon of 18 January 2006 indicated that the summit was steaming vigorously, consistent with the formation of a new lava dome. Evidence of explosive ejection of volcanic bombs included circular craters the size of large trucks seen on the NW flank. Block-and-ash-flow deposits with car-sized blocks produced by dome collapse covered parts of the SE flank. Surge deposits were observed on the NW flank. A white steam plume was observed rising to about 2,600 m altitude before it trailed off as a bluish haze to the E. Little to no ash appeared to be present in the plume. After the eruption at 0758 on 17 January, seismicity diminished significantly and AVO lowered the color code from Red to Orange late on 18 January. By the morning of 19 January seismicity remained fixed at lower levels; it decreased further on 20 January but still stood above background. Periods of quiescence and low seismicity in the intervals between eruptive events are not unusual at Augustine, having occurred during the 1976 and 1986 eruptive episodes. By 25 January seismic activity at Augustine remained low but above background levels. During 23-26 January, satellite observations indicated the persistence of faint thermal anomalies. On 26 January steaming continued at the summit (figure 25). Figure 25. Augustine as seen from the NE on 24 January 2006 when a steam-and-gas plume drifted SSE. Image courtesy of M.L. Coombs and AVO/ USGS. Information Contacts: Alaska Volcano Observatory (AVO), a cooperative program of the U.S. Geological Survey, 4200 University Drive, Anchorage, AK 99508-4667, USA (URL: http://www.avo.alaska.edu/), Geophysical Institute, University of Alaska, PO Box 757320, Fairbanks, AK 99775-7320, USA, and Alaska Division of Geological & Geophysical Surveys, 794 University Ave., Suite 200, Fairbanks, AK 99709, USA; Jesse Allen, NASA Earth Observatory, Pavel E. Izbekov, Geophysical Institute, University of Alaska Fairbanks, 903 Koyukuk Drive, PO Box 757320 Fairbanks, AK 99775-7320, USA; Anchorage VAAC, Alaska Aviation Weather Unit, 6930 Sand Lake Road, Anchorage, AK 99502-1845,USA (URL: http://vaac.arh.noaa.gov/). Following a period of increased seismicity at Augustine that began in May 2005, discrete seismic events on 9 and 11 December may have perturbed the hydrothermal system, initiating small steam explosions. On 12 December, a plume extended 75 km SE of the volcano, and its S and E flanks were dusted with ash (likely non-juvenile). Additional steam explosions took place later in the month, and the smell of sulfur was reported by residents in villages on the E side of Cook Inlet. The first major eruptions at Augustine occurred on 11 January 2006, when two discrete explosions produced an ash cloud that reached 9 km altitude (BGVN 30:12) and the Concern Color Code was raised to Red. Further eruptions occurred on 13, 14, and 17 January. After the eruption at 0758 on 17 January, seismicity diminished significantly and AVO lowered the color code from Red to Orange late on 18 January. By the morning of 19 January seismicity remained fixed at lower levels; it decreased further on 20 January but was still above background. Periods of quiescence and low seismicity in the intervals between eruptive events are not unusual at Augustine, having occurred during the 1976 and 1986 eruptive episodes. During 23-26 January, satellite observations indicated the persistence of faint thermal anomalies and steaming continued at the summit. Occasional intervals of increased seismicity were observed for the next few days. On 27 January 2006 an explosive eruption began at about 2000 and lasted for 9 minutes. AVO raised the color code from Orange to Red. According to the National Weather Service (NWS), an ash cloud reached a maximum altitude of around 9 km and drifted SE. Augustine erupted again at 2337 on 27 January 2006. This event lasted 1 minute and no ash was detected above 3 km. A third eruption occurred at 0204 on 28 January 2006 and lasted 2 minutes. Ash drifted SE at an altitude of about 8 km according to NWS. A fourth eruption occurred at 0742 on 28 January and lasted 3 minutes; the ash cloud drifted SE at a maximum altitude of 7.5 km. Another explosive event began at 1430 on 28 January. Seismic activity continued and continuous ash emission was observed in AVO web camera images. NWS reported ash to 9 km altitude travelling SSW. Following this explosion, Augustine was in a state of continuous eruption accompanied by persistent ash emission until around 3 February. Overflight observations on 29 January suggested that pyroclastic flows were being produced. NWS radar indicated that ash clouds from events at 1117 on 29 January, and 0325 and 0621 on 30 January, rose to 7.5 km altitude. Other than during these three events an ash-rich plume rose to about 4 km altitude. On 30 January, Alaska Airlines canceled all flights into and out of Anchorage because of the potential danger of ash. Flights resumed on 31 January. On 1 February AVO lowered the Concern Color Code from Red to Orange. Although seismic data indicated sustained eruptive activity, ash clouds to altitudes greater than 4.5 km altitude had not been observed on NWS radar since 0621 on 30 January. Low-level explosions, pyroclastic flows, and production of ash continued (figure 26). Figure 26. A satellite image showing the Augustine eruption on 2 February 2006. 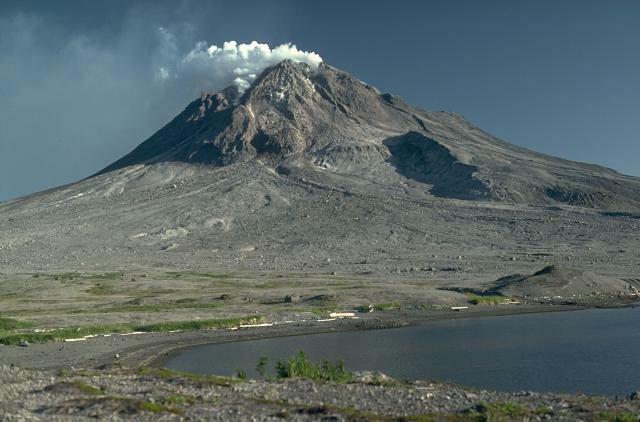 On that day the Alaska Volcano Observatory reported a continuous ash plume accompanied by low-level explosions and pyroclastic flows of hot ash and rock fragments. This image was taken by the Moderate Resolution Imaging Spectroradiometer (MODIS) onboard the Terra satellite. Augustine is partially outlined in this image, indicating a ground surface much hotter than its surroundings; the volcano's ash plume is pale gray-beige, barely darker than the nearby weather clouds. However, the weather clouds can be discerned from the ash by their distinct dot-like pattern. NASA image courtesy Jeff Schmaltz, MODIS Rapid Response Team at NASA GSFC. By 3 February seismic data indicated that low-level explosions, block-and-ash-flows, and sustained production of ash were continuing intermittently and had changed little in character or intensity since 1 February. Seismicity dropped significantly on the evening of 3 February. Observers on an overflight on 3 February saw a steam-rich, ash-poor plume emerge from the cloud tops and reach no higher than 2 km altitude. NWS reported no ash in satellite or radar data. Observations by AVO scientists during visits on 8 February, as well as satellite and seismic data and other remote observations, indicated that a lava dome was present at the summit. Streams of gas, ash, and incandescent blocks were observed descending the upper NE flank on the evening of 7 February and early on the 8th, indicating that small-volume collapses of the lava dome were occurring and that the dome was actively growing. Seismicity remained at low levels, though still above background. Low-level ash plumes and occasional pyroclastic flows on the flanks continued. A persistent thermal signal was observed in satellite data. Incandescence was visible from Homer. On 11 February, seismic data indicated that the new lava dome at Augustine's summit continued to grow. Seismic stations on the flanks of the volcano recorded rockfalls and pyroclastic flows associated with small-volume collapses of the lava dome. A plume composed of gas, steam, and small amounts of ash continued to be emitted from the summit, and low-level, dilute ash clouds were likely present in the vicinity of the volcano. Just before midnight on 12-13 February a low-light camera operated by the University of Alaska Fairbanks captured a small hot avalanche down the north flank of the volcano. The event was also recorded on AVO's pressure sensor on Augustine Island. A light dusting of new ash on the E flank of the volcano may have been related to this avalanche event. Satellite data on 13 February showed a persistent thermal anomaly at the volcano's summit. Together, these data suggested that the lava dome continued to grow and underwent occasional, minor collapse events. On 16 February, clear satellite views showed a strong thermal anomaly in the summit crater area. Seismometers continued to record rockfalls and small pyroclastic-flow signals indicative of occasional, minor collapses of the lava dome. Over 10-16 February, the number of these events declined steadily, suggesting that the rate of lava effusion was slowing. An observation flight on 16 February obtained good views of the summit: a new, steaming, blocky lava dome occupied the summit crater. The dome filled much of the crater and extended as a rubbly tongue 500-800 m down the upper N flank. Dark aprons of collapse debris, including large steaming blocks, extend downslope to the N. The rim of the summit crater was largely snow-free and mantled by thick, coarse, pyroclastic deposits, likely from the explosive events in January. The dome resulted from the largely non-explosive extrusion of degassed lava following the cessation of explosive activity on January 30. By the end of this report period (22 February) unrest was continuing. Seismicity remained above background levels. Rockfalls and avalanches from the lava dome continued but appeared to be declining in frequency. Satellite images continued to show a persistent thermal anomaly. A plume composed of variable amounts of gas, steam, and small amounts of ash likely continued intermittently from Augustine's summit. Dome building eruptive activity may continue intermittently over the next several months. Aviation hazard. Tina Neal (USGS-AVO) provided some thought-provoking insights into Augustine's aviation-ash issues. The following quote with minor modification is information she sent in a 14 February email message to the Volcanicclouds listserve, some follow up messages, and a review. "Volcanologists often rely upon pilot observations to provide the all-important visual confirmation and description of distant volcanic events. What we need to remember, however, is that it is quite difficult to get more than snippets of information in a PIREP [aviation pilot report]: Pilots and controllers are often extremely busy and controllers cannot ask more than very basic follow up questions. Air traffic communication protocols put a premium on succinct transmissions. I was lucky enough recently to hear this play out in real time during an Augustine eruption when I happened to be visiting the Anchorage Air Traffic Control facility and was allowed to plug in to monitor the sector around Augustine. While we should continue to encourage full and detailed PIREPs following the VAR [Volcanic Activity Report] format, we should not be terribly surprised when the return is not very complete. Similarly, follow up communications directly with the pilot, possible in some cases, are difficult and not the highest priority of Observatory staff. "Thus far for the Augustine eruption, we do have documentation of impacts from the ash clouds and the distal fine ash and SO2 cloud from explosive events, largely taken from PIREPS passed to AVO by the FAA and the National Weather Service. In addition to these instances below, flight routes were moved in anticipation of possible ash cloud motion following several explosions, and flight cancellations did occur. "[1.] On 14 January a jet aircraft about [80 km E] of Yakutat at FL310 [9.4 km altitude, at 59 deg. 30.65 min. N, 139 deg. 8.89 min. W; ~800 km from Augustine] skimmed through the top of the 'brown' cloud for about 10 minutes and reported smelling a 'dirty, musty odor.' The pilot climbed to FL330 and deviated to the NE around the cloud. [The plane was out of service for two days.] Borescope inspection upon landing showed no damage and no ash accumulation. [Later anaysis suggested the ash cloud encountered may have been a combination of 5 separate drifting ash clouds from 5 separate discrete events during 13-14 January.] "[2.] On the same day, another jet near the same location saw a brown haze layer about 2000 feet [610 m] thick and made a climbing turn to avoid it. "[3. On] 31 January [there were reports of a] light sulfur smell from several aircraft over Anchorage. "[4.] AVO received the followings email account about a possible encounter between a Cessna Cherokee and a distant ash cloud from Augustine on 30 January (we have yet to follow up for any further information and verification). "I am traveling in the Bristol Bay Area and was in Togiak last night. Last night I started coughing and sneezing and on the flight to Dillingham this morning the pilot and I noticed volcanic ash in the air from ground level and according to the pilot up to 7,000 feet [2.1 km altitude]. The ash is very fine but is sticking to the wind screen of the aircraft. Along with the ash my eyes were stinging and I noticed a little burning in my nose. As we approached the Dillingham area and got out of the mountains the air quickly cleared. At this time it seems to only be in the mountains and according to the pilots in different places all the way to King Salmon. I do not know if you have received these reports yet." In addition, Volcaniclouds discussions included this message from Ken Dean (Geophysical Institute-AVO). It provided some further discussion and references on past eruption-cloud behavior from Mt. Cleveland (1,250 km SW of Augustine). ". . . there was an incident on 22 February 2001 attributed to a volcanic cloud from the eruption of Cleveland Volcano on 19 Feb. 2001. A PIREP from a B747 near San Francisco [California] reported a strong (sulfur) smell and particles in the cabin. At first we thought this was an erroneous report since it was so far from the eruption and satellite date did not show anything in the region of the aircraft. However, when we ran the Puff dispersion model using re-analysis data, the simulated volcanic cloud encountered the aircraft at the time of the PIREP. This was a match in space, time and altitude. Note: Puff runs using predicted data were somewhat ambiguous regarding this encounter but the re-analysis data were much more definitive." References. Dean, K.G., Dehn, J., Papp, K.R., Smith, S., Izbekov, P., Peterson, R., Kearney, C., and Steffke, A., 2004, Integrated satellite observations of the 2001 eruption of Mt. Cleveland: Alaska, J. Vol. Geophys. Res., v. 135, p. 63, doi10.1016/j.jvolgeores.2003.12.013. Simpson, J.J., Hufford, G.L., Pieri, D., Servranckx, R., Berg, J.S., and Bauer, C., 2002, The February 2001 Eruption of Mount Cleveland, Alaska: Case Study of an Aviation Hazard: Weather and Forecasting, v. 17, p. 691-704. Information Contacts: Anchorage VAAC, Alaska Aviation Weather Unit, National Weather Service, 6930 Sand Lake Road, Anchorage, AK 99502, USA (URL: http://aawu.arh.noaa.gov/vaac.php); Alaska Volcano Observatory (AVO), a cooperative program of the U.S. Geological Survey, 4200 University Drive, Anchorage, AK 99508-4667, USA (URL: http://www.avo.alaska.edu/), Geophysical Institute, University of Alaska, PO Box 757320, Fairbanks, AK 99775-7320, USA, and Alaska Division of Geological & Geophysical Surveys, 794 University Ave., Suite 200, Fairbanks, AK 99709, USA; Jesse Allen, NASA Earth Observatory; Tina Neal, U.S. Geological Survey-Alaska Volcano Observatory; Ken Dean and Pavel E. Izbekov, Geophysical Institute, University of Alaska. Although the previous report (BGVN 31:01) noted Augustine's events through 22 February 2006, this one overlaps and further discusses some aspects of behavior during late January through 1 February 2006. This report then continues with summaries of Alaska Volcano Observatory (AVO) reports during 24 February to 26 March 2006. After eight months of increasing seismicity, gas-and-steam emissions, and phreatic eruptions in December 2005, Augustine began magmatic eruptions on 11 January 2006 (BGVN 30:12). Eruptions continued throughout January, producing ash clouds up to ~ 9 km altitude. The eruption was described by Jon Dehn (University of Alaska Fairbanks, personal communication) as occurring in the following three phases: I) 11-28 January; II) 29 January-4 February; and III) 5 February and into at least late March. During 11 January to 21 March 2006 (70 days), the Anchorage Volcanic Ash Advisory Center (VAAC) issued text reports (Volcanic Activity Advisories) on Augustine 567 times (averaging 8.1 reports per day). These alerted the aviation community to the ongoing airborne-ash hazards. Augustine lies ~ 277 km SW of Anchorage's airport, a key hub for flights across the North Pacific. According to the US Department of Transportation, during 2003 Anchorage's airport supported the largest tonnage of any in the US, and functioned as the 8th busiest in the US by value of shipments. Augustine's eruptions can potentially impact aviation and operations at the airport, and more generally, they complicate North Pacific air travel. Plumes, 28 January-1 February. AIRS SO2 retrievals for Augustine plumes on 28 and 29 January were provided by Fred Prata (figure 27). He commented that the SO2 "blobs" seem to spread out rather than elongate into a plume shape, possibly because of calm winds or intermittent ejections. Figure 27. Atmospheric SO2 from the AIRS instrument for Augustine plumes on 28 and 29 January 2006. Details of the processing and resulting analysis are included on the four panels, which correspond to these dates and times (UTC): a) 12:11:25 on 28 January, b) 21:47:25 on 28 January, c) 23:29:25 on 28 January, and d) 12:53:25 on 29 January. All images provided courtesy of Fred Prata (Norwegian Institute for Air Research). Shortly after the 28-29 January plumes mentioned above, on 30 January, an overflight by AVO confirmed a ~ 5-km-tall volcanic cloud and small explosions and associated pyroclastic flows. The airborne observations indicated that a considerable amount of ash was being produced during this time period from small explosions and associated pyroclastic flows. Figures 28 and 29 show images from 30 January. AVO also presented 31 January thermal infrared images similarly indicative of vigorous eruptions and fresh pyroclastic flows (figure 30). Figure 28. Aerial view of Augustine during an eruption on 30 January 2006. The volcano was shrouded in ash cloud. The plume blew NE. Courtesy of Pavel Izbekov, AVO/UAF-GI. Figure 29. A MODIS satellite image for 30 January at 12:30:00 showing an Augustine ash and steam plume. This image was collected at approximately the same time as an AVO overflight, and shows the volcanic cloud moving NE at ~ 4.8 km altitude. Processing and interpretation courtesy of Dave Schneider, USGS-AVO. Image courtesy of MODIS Rapid Response Project at NASA/GSFC. Figure 30. Two 31 January 2006 (at 22:50:44 AST; 1 February 2006 UTC) night-time ASTER thermal infrared (TIR) images showing hot pyroclastic flow deposits on Augustine's N flank. The image on the left also shows a broad ash and SO2 plume extending ENE. Image processing and interpretation courtesy of Rick Wessels (AVO-USGS); ASTER data courtesy of NASA/GSFC/METI/ERSDAC/JAROS, and US/Japan ASTER Science Team. René Servranckx looked at several images from 1 February 2006 and sent associated messages and links to the Volcanicclouds listserv. He found a hotspot at Augustine and identified various cloud features from plumes. Using a NOAA-12 IR image taken at 1542 UTC, Servranckx could not detect an ash signature in the split window. On 4 February, Ken Dean (UAF) posted a message on the Volcanicclouds listserv discussing Augustine for 28 January-1 February. He noted that, regarding SO2 detection in northern Alaska, they had been monitoring the atmospheric transport direction using Puff, a modeling routine for predicting the atmospheric dispersal of ash clouds. Generally speaking, trajectories were to the N and over Fairbanks. Accordingly, lidar systems at both the UAF's Geophysical Institute and ~ 50 km N of Fairbanks at the Poker Flat Rocket Range were turned on to see if they could detect volcanic aerosols from the eruption. Lidar uses laser energy to probe the atmosphere, where it can detect suspended material such as volcanic aerosols in identifiable regions. Preliminary results indicated volcanic aerosols at 4.6-6.6 km altitude in the atmosphere above both Fairbanks and Poker Flats. There could also have been volcanic aerosols at lower altitudes in the weather clouds. Dean also noted that ground-based event-monitoring collectors set out by Cathy Cahill (UAF) sampled volcanic aerosols and possible traces of ash at Fairbanks. He noted that these observations and trajectories were consistent with Prata's SO2 observations and Servranckx's back trajectories. 24 February-26 March 2006. On 24 February, AVO noted repeated and ongoing unrest during the past week. This included relatively low but above-background seismicity that indicated small, intermittent rockfalls and avalanches from the lava dome. Satellites detected a persisting thermal anomaly in the summit area. These data, along with a 20 February visit to the island, indicated continued slow growth at the summit lava dome. A veil of fresh, light ash dressed Augustine's flanks. The ongoing AVO reports into March noted similar processes and observations, and soon included mention of ash plumes, a lava flow, and a pyroclastic flow. An overflight of the volcano on 1 March revealed a short, stubby lava flow that extended NE from the dome, terminating at ~ 1 km elevation. AVO noted a small dilute ash plume as well as a 20-minute interval of elevated seismicity at 1010 on 5 March, interpreted as a small explosion with associated ash emission, although low clouds obscured web-camera views. On 6 March AVO reported seismic signals and the low-light camera in Homer suggested rockfalls and avalanches. Although Augustine's plumes in this time frame were generally characterized as local, dilute, and under ~ 1 km above the summit, pyroclastic flows were also seen on 6 March. Early on the morning of 8 March, AVO's seismometers began recording periods of discrete, repetitive, small events. These signals were taken to indicate ongoing dome growth, observations consistent with those from web cameras, which revealed minor ash emissions and mass wasting. Reports on 8 and 9 March discussed seismicity sufficiently elevated as to sometimes saturate several instruments. In addition, cameras portrayed two areas of high thermal flux. AVO initially interpreted these observations as including elevated rates of lava extruding into the dome, possibly with vigorous lava movement, and block-and-ash flows. Later reports disclosed further details from around 9 March. AVO's 8-10 March reports noted that the summit was steaming more vigorously than the previous 3-4 weeks. A brownish-orange plume rose from the top of the summit lava dome. Fumaroles on the S and W side of the dome were the source of the most vigorous steaming. Areas of bare ground on the upper W and S flanks had substantially enlarged since 1 March. The greatest amounts of steam came from bare areas on the upper NW flank. Web-camera images and observations from overflights on 8 and 9 March indicated regular small-scale collapses of the summit lava dome. Usually these collapse events produce block-and-ash flows and small diffuse ash clouds. Block-and-ash flows to the E to NE sectors extended to within about 1 km of the coastline. Dilute ash clouds were observed rising from the block-and-ash flows to about the level of the summit and drifting away with the wind. 10 March seismicity included prolonged volcanic tremor and an increase in the frequency of small volcano-tectonic earthquakes. Block-and-ash flows, rock avalanches, and rockfalls originating from the summit lava dome continue to be recorded by the seismic network, particularly at the E flank station. The 10 March report stated that "Satellite and low-light camera images obtained intermittently throughout the week show that thermal anomalies in the summit area and on the upper NE flank persist. On several evenings this past week, a low-light camera at the AVO site in Homer captured hot avalanches in progress and prolonged periods of incandescence. AVO also received several reports from observers in Homer and Nanwalek of summit glow in the evening hours. Airborne measurements of gas emissions made on March 9 indicate both SO2 and CO2 gas in the plume. This is the first time since the fall of 2005 that CO2 has been a component of the gas plume and likely indicates the presence of new magma entering the volcanic system." The AVO report for 17 March chronicled low-level eruptive activity. It said that the past week's seismicity changed from periods of prolonged tremor and closely spaced discreet events to episodic short-duration events. Observers interpreted the change as indicating that steady effusion of lava and dome growth had given way to slower effusion of lava and intermittent block-and-ash flows, rock avalanches, and rock-falls from the summit lava dome. On several evenings during the week, clear atmospheric conditions enabled low-light cameras at the AVO site in Homer to capture hot avalanches and prolonged periods of incandescence in both the summit area and on the upper NE flank. Satellite images also showed thermal anomalies. The 17 March report said that overflights indicated two lava flows were seen on the N and NE flanks. They advanced slowly. Occasional collapses of the lava flow fronts shed hot blocks and produce minor ash emissions. Estimates using photographs indicated that the new lava dome stood ~ 70 m higher than the one formed in 1986. Little new information was discussed in AVO reports issued on 20-26 March. The 26 March report included the remark that satellite views were then obscured by cloud cover; however, vigorous steaming from the summit was visible with the on-island web camera. Correction. A previous Augustine report (BGVN 30:12; issued in early 2006) had a typographic error in the title: "Eruptions begin 11 January 2005 and eight outbursts occur by late January)." The year has since been changed on our website to 11 January 2006. Information Contacts: Jon Dehn, Cathy Cahill, Ken Dean, and Pavel E. Izbekov, Geophysical Institute, University of Alaska Fairbanks, 903 Koyukuk Drive, PO Box 757320 Fairbanks, AK 99775-7320, USA; Anchorage VAAC, Alaska Aviation Weather Unit, National Weather Service, 6930 Sand Lake Road, Anchorage, AK 99502, USA (URL: http://aawu.arh.noaa.gov/vaac.php); Fred Prata, Norwegian Institute for Air Research, P.O. Box 100, 2027 Kjeller, Norway; René Servranckx, Montreal Volcanic Ash Advisory Centre, Canadian Meteorological Centre, Meteorological Service of Canada, 2121 North Service Road, Trans-Canada Highway, Dorval, Quebec, H9P 1J3 Canada; Alaska Volcano Observatory (AVO), a cooperative program of the U.S. Geological Survey, 4200 University Drive, Anchorage, AK 99508-4667, USA (URL: http://www.avo.alaska.edu/), Geophysical Institute, University of Alaska, PO Box 757320, Fairbanks, AK 99775-7320, USA, and Alaska Division of Geological & Geophysical Surveys, 794 University Ave., Suite 200, Fairbanks, AK 99709, USA. During the latter half of 2006 and through January 2007, Augustine experienced low-level activity, in stark contrast to the energetic eruptions of January and February 2006 (BGVN 31:04). Five ocean-bottom seismometers were deployed on 8 February 2006 around Augustine Island in Cook Inlet to assist the Alaska Volcano Observatory (AVO) in monitoring activity on the island. Figure 31 shows new deposits as of April 2006. This report covers the declining volcanism from April 2006 through January 2007. Figure 31. New deposits from the current Augustine eruption, as of mid-April 2006. This map was created using aerial observations, photos, satellite images, and limited field work. Courtesy of Alaska Volcano Observatory. Activity during mid-2006. The frequency of rock falls, avalanche events, and hot block-and-ash flows consistently decreased during April to August 2006. One exception was a minor spike consisting of 17-18 April avalanche signals that were larger relative to those seen in previous weeks. Based on aerial observations on 19 April, an active rock fall and avalanche chute developed near the margin of the new lava flow/dome complex in the NW summit area. Associated rockfalls contributed to an ash blanket visible on the SW flank. Steaming was consistently seen during periods of visibility (figure 32). Visible growth of the lava dome continued, and the new dome and lava flows remained highly unstable through June 2006. Web camera views showed a low-level steam plume during the first two weeks of June 2006. According to the Anchorage VAAC, on 27 July 2006 around midnight, a pilot reported an ash emission that reached ~ 1.5 km altitude and drifted SSE. There was no seismic evidence for the event. Figure 32. Photograph taken on the afternoon of 12 July 2006 from the E, showing the upper NE flank of Augustine volcano and the new lava dome. Courtesy of AVO and Game McGimsey. On 28 April, AVO lowered the Concern Code level from orange to yellow where it remained until August. Satellite images indicated declining thermal output consistent with the decrease in activity during April 2006. Airborne sulfur dioxide gas measurements showed continued high levels of magmatic gas emission that could be associated with degassing of lava at the summit in April 2006. Weak thermal anomalies persisted in satellite data through August 2006, and seismic levels decreased to background by this time. On 9 August 2006, it lowered the level of Concern Color Code from yellow to green (the lowest level). Activity during late 2006-early 2007. Since 9 August 2006, seismicity remained at or near background and AVO did not detect ash plumes or significant temperature fluctuations. Brief seismic activity occurred during 11 September-4 October 2006. During that time period, the number of earthquakes rose from zero to seven, followed by a plunge of activity that persisted through January 2007. AVO web camera views showed typically light steaming from the summit from September 2006 to January 2007. Information Contacts: Alaska Volcano Observatory (AVO), a cooperative program of the U.S. Geological Survey, 4200 University Drive, Anchorage, AK 99508-4667, USA (URL: http://www.avo.alaska.edu/), Geophysical Institute, University of Alaska, PO Box 757320, Fairbanks, AK 99775-7320, USA, and Alaska Division of Geological & Geophysical Surveys, 794 University Ave., Suite 200, Fairbanks, AK 99709, USA. 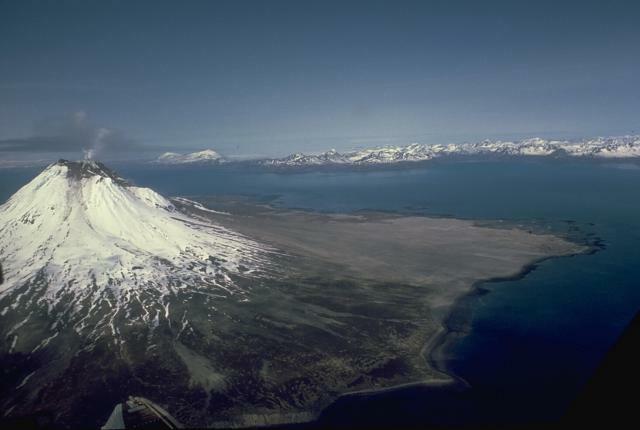 Augustine volcano, rising above Kamishak Bay in the southern Cook Inlet about 290 km SW of Anchorage, is the most active volcano of the eastern Aleutian arc. It consists of a complex of overlapping summit lava domes surrounded by an apron of volcaniclastic debris that descends to the sea on all sides. Few lava flows are exposed; the flanks consist mainly of debris-avalanche and pyroclastic-flow deposits formed by repeated collapse and regrowth of the volcano's summit. The latest episode of edifice collapse occurred during Augustine's largest historical eruption in 1883; subsequent dome growth has restored the volcano to a height comparable to that prior to 1883. The oldest dated volcanic rocks on Augustine are more than 40,000 years old. At least 11 large debris avalanches have reached the sea during the past 1800-2000 years, and five major pumiceous tephras have been erupted during this interval. Historical eruptions have typically consisted of explosive activity with emplacement of pumiceous pyroclastic-flow deposits followed by lava dome extrusion with associated block-and-ash flows. Beget J E, Kienle J, 1992. Cyclic formation of debris avalanches at Mount St. Augustine volcano. Nature, 356: 701-704. Beget J E, Kowalik Z, 2006. Confirmation and calibration of computer modeling of tsunamis produced by Augustine volcano, Alaska. Sci Tsunami Hazards, 24: 257-266. Beget J, Gardner C, Davis K, 2008. Volcanic tsunamis and prehistorical cultural transitions in Cook Inlet, Alaska. J. Volcanol. Geotherm. Res., 176: 377-386. Henning R A, Rosenthal C H, Olds B, Reading E (eds), 1976. 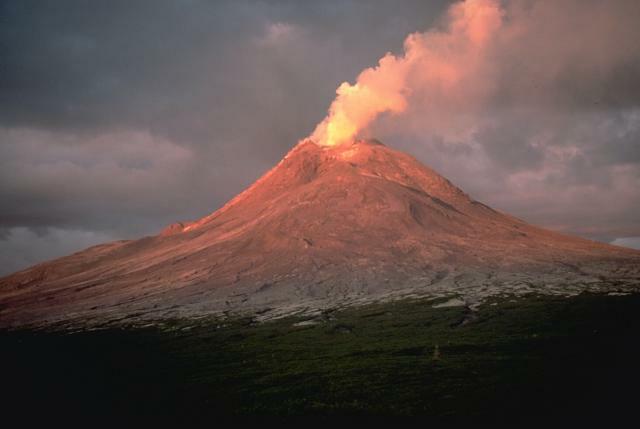 Alaska's volcanoes, northern link in the ring of fire. Alaska Geog, 4: 1-88. Johnson K E, Harmon R S, Richardson J M, Moorbath S, Strong D F, 1996. Isotope and trace element geochemistry of Augustine volcano, Alaska: implications for magmatic evolution. J Petr, 37: 95-115. Kamata H, Johnston D A, Waitt R B, 1991. Stratigraphy, chronology, and character of the 1976 pyroclastic eruption of Augustine volcano, Alaska. Bull Volcanol, 53: 407-419. Kienle J, Kowalik Z, Murty T S, 1987. Tsunamis generated by eruptions from Mount St. Augustine volcano, Alaska. Science, 236: 1442-1447. Kienle J, Swanson S E, 1980. 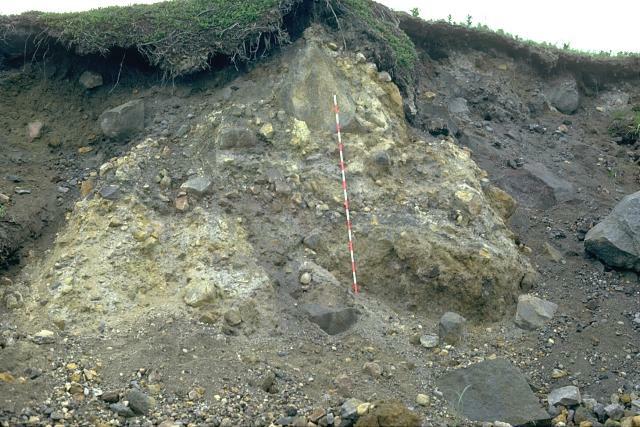 Volcanic hazards from future eruptions of Augustine volcano, Alaska. Univ Alaska Geophys Inst, UAG R-275, 122 p.
Miller T P, McGimsey R G, Richter D H, Riehle J R, Nye C J, Yount M E, Dumoulin J A, 1998. Catalogue of the historically active volcanoes of Alaska. U S Geol Surv Open-File Rpt, 98-582: 1-104. Siebert L, Beget J E, Glicken H, 1995. The 1883 and late-prehistoric eruptions of Augustine volcano, Alaska. J. Volcanol. Geotherm. Res., 66: 367-395. Siebert L, Glicken H, Kienle J, 1989. Debris avalanches and lateral blasts at Mount St. Augustine volcano, Alaska. Natl Geog Res, 5: 232-249. Swanson S E, Kienle J, 1988. The 1986 eruption of Mount St. Augustine: field test of a hazard evaluation. J. Geophys. Res, 93: 4500-4520. Waitt R B, 2010. Ejecta and landslides from Augustine volcano before 2006. In: Power J A, Coombs M L, Freymueller J T (eds) U S Geol Surv Prof Pap, 1769: 297-319. Waitt R B, Beget J E, 1996. Provisional geologic map of Augustine volcano, Alaska. U S Geol Surv Open-File Rpt, 96-516: 1-44. Waitt R B, Beget J E, 2009. 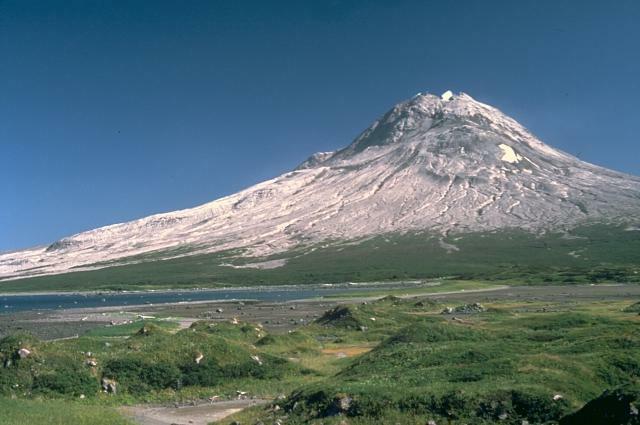 Volcanic processes and geology of Augustine volcano, Alaska. U S Geol Surv Prof Pap, 1762: 1-78. Waythomas C F, Waitt R B, 1998. Preliminary volcano-hazard assessment for Augustine volcano, Alaska. U S Geol Surv Open-File Rpt, 98-106: 1-39. There is data available for 23 Holocene eruptive periods. There is data available for 4 deformation periods. Expand each entry for additional details. Remarks: The 1986 and 2006 pyroclastic flow deposits are subsiding. 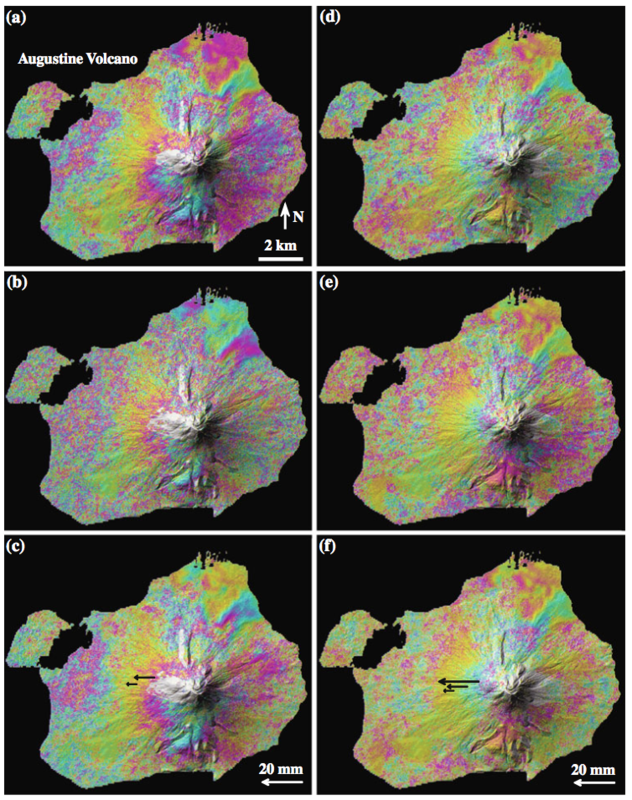 Remarks: InSAR results show that the upper west flank of Augustine exhibited outward horizontal displacements of up to 20 mm as a result of the 2006 eruption. Reference List: Lu and Dzurisin 2014; Cervelli et al. 2010. Cervelli, P., et al., 2010. Ground deformation pertaining to the 2006 eruption of Augustine volcano, . in The 2006 Eruption of Augustine Volcano, Alaska edited by J. A. Power, M. L. Coombs, and J. T. Freymueller, U.S. Geol. Surv. Prof. Pap., 1769, p. 427-452. Remarks: The 1986 pyroclastic flow deposit is steadily subsiding. Maps of averaged deformation rate for Augustine Volcano from the refined small baseline subset (SBAS) technique for the period 1992?2005. A, Satellite track 229. B, Satellite track 501. Results from two independent tracks show similar results. Largest displacements are associated with subsidence of 1986 pyroclastic flow deposits in upper right quadrants of the maps. From: Lee et al. 2010. Reference List: Masterlark et al. 2006; Lee et al 2008; Lu and Dzurisin 2014; Lee et al. 2010. Lee, C. W., Lu, Z., Jung, H. S., Won, J. S., & Dzurisin, D., 2010. 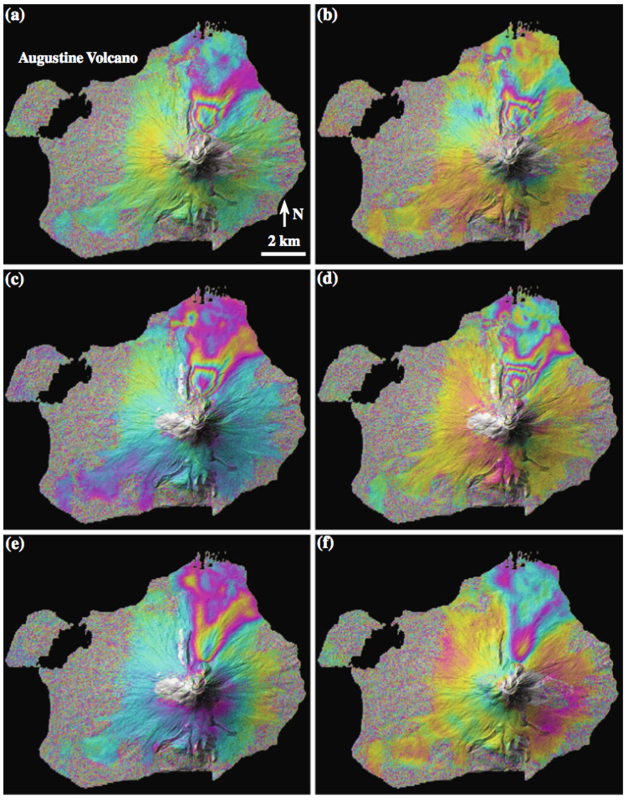 Surface deformation of Augustine Volcano, 1992-2005, from multiple-interferogram processing using a refined small baseline subset (SBAS) interferometric synthetic aperture radar (InSAR) approach. . The 2006 Eruption of Augustine Volcano, Alaska, Power, J. A., Coombs, M. L., and Freymueller, J. T., editors, U.S.G. S. Professional Paper 1769, p. 453-465. Lee, C. W., Lu, Z., Kwoun, O. I., & Won, J. S., 2008. Deformation of the Augustine Volcano, Alaska, 1992-2005, measured by ERS and ENVISAT SAR interferometry. Earth, planets and space, 60(5), 447-452. Remarks: Small baseline subset (SBAS) InSAR reveals uplift of 2-8 cm of Augustine volcano from 1992 to 1995. A model consisting of a shallow inflating point source and a deeper contracting point source fits the data well. Reference List: Lee et al. 2010. There is data available for 2 emission periods. Expand each entry for additional details. Steam rises from the summit of snow-capped Augustine volcano in this July 1988 view from the east. The light-brown, unvegetated areas on the north flank of the volcano are pyroclastic-flow deposits from the 1986 and earlier historical eruptions. The 1986 pyroclastic flows reached the sea east and west of the darker-colored area forming the point at the right-hand side of the island. The Chigmik Mountains rise across Kamishak Bay in the distance. Photo by Bill Rose, 1988 (Michigan Technological University). 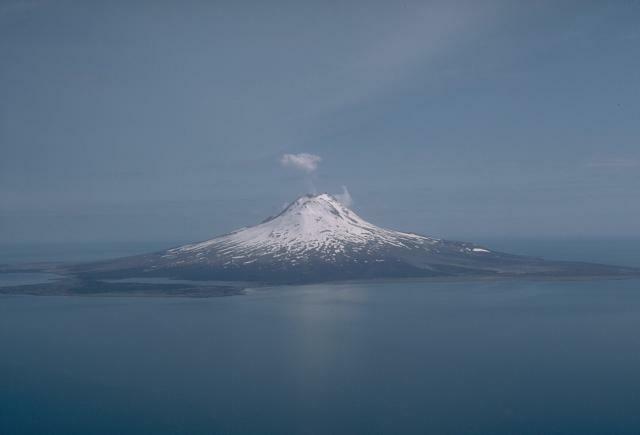 Augustine volcano, in Kamishak Bay in the southern Cook Inlet, is the most active volcano of the eastern Aleutian arc. It consists of a complex of overlapping summit lava domes surrounded by an apron of volcaniclastic debris that descends to the sea on all sides. 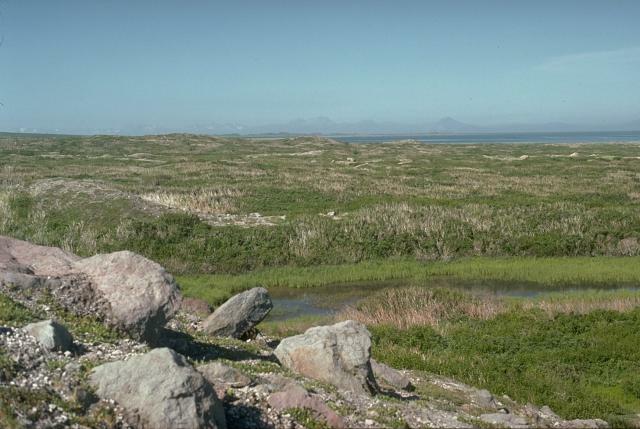 This view from the NW shows the steaming summit of Augustine in 1986 reflected in a shallow lagoon separating the main island of Augustine from West Island. Twentieth-century eruptions have included explosive activity with pyroclastic flows and lava dome extrusion. Photo by Lee Siebert, 1986 (Smithsonian Institution). Late evening alpenglow colors a strong column of steam boiling off a degassing lava dome at the summit of Augustine volcano during its 1986 eruption. This June 1986 view from the NW shows a blanket of pyroclastic-fall and -flow deposits covering the upper flanks, which would normally be partially covered with snow fields at this time of year. A volcanologist observes a large, 6-m-high block that was carried about 4 km down the north flank of Augustine volcano in Alaska during the 1976 eruption. 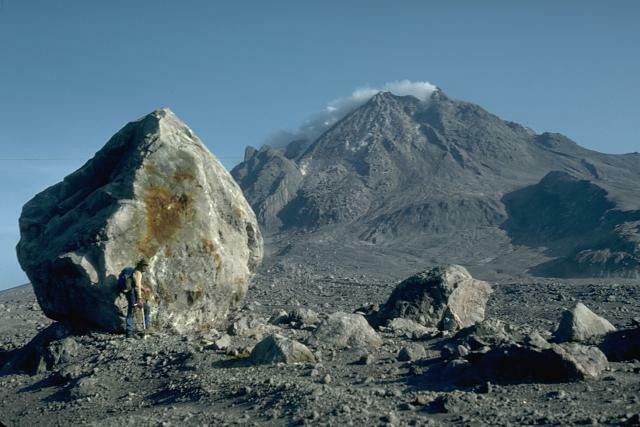 Blocks of this size and larger are fragments of the summit lava dome that were carried within block-and-ash flows produced by periodic collapse of the growing dome. This photo was taken during a quiet phase of the 1986 eruption and shows the steaming summit lava dome. Photo by Harry Glicken, 1986 (U.S. Geological Survey). Remnants of four lava domes can be seen in this July 1986 photo of the summit of Augustine volcano as viewed from the north. Degassing of the new 1986 lava dome produces a vigorous steam plume. Eruptions of Augustine commonly begin with explosive removal of portions of lava domes capping the summit and conclude with the extrusion of a new lava dome. Renewed extrusion of the 1986 dome, which was emplaced within an arcuate crater cutting the 1976 dome, occurred 1 month after the time of this photo. Augustine volcano, seen here from West Island to its NW, is the most active volcano of the eastern Aleutian arc. It consists of a complex of overlapping summit lava domes surrounded by an apron of volcaniclastic debris that descends to the sea on all sides. The hummocky deposit in the foreground is a roughly 450-year-old debris-avalanche deposit, one of many that ring the island as a result of repetitive collapse of the summit lava dome. Twentieth-century eruptions have included explosive activity with pyroclastic flows and lava dome extrusion. Photo by Lee Siebert, 1987 (Smithsonian Institution). Collapse of the summit and flank of a volcano can produce massive volcanic landslides. The resulting highly mobile debris avalanches rapidly sweep down the volcano and far beyond its flanks. 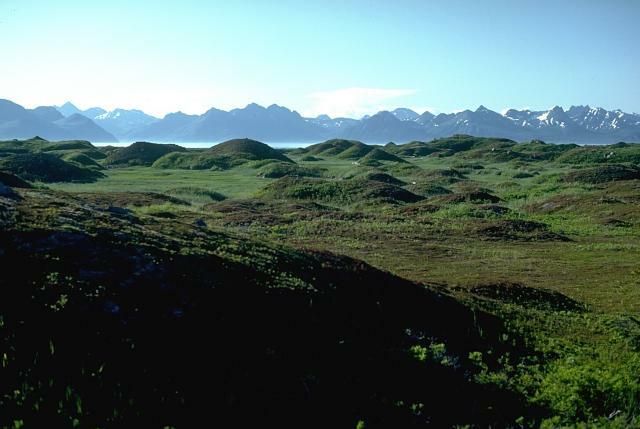 These small hills in the foreground of Alaska's Augustine volcano show a morphology common to debris-avalanche deposits. The hummocks consist of relatively intact segments of the volcanic edifice that were transported long distances without disaggregating. This debris avalanche traveled roughly 11 km from the summit about 450 years ago. 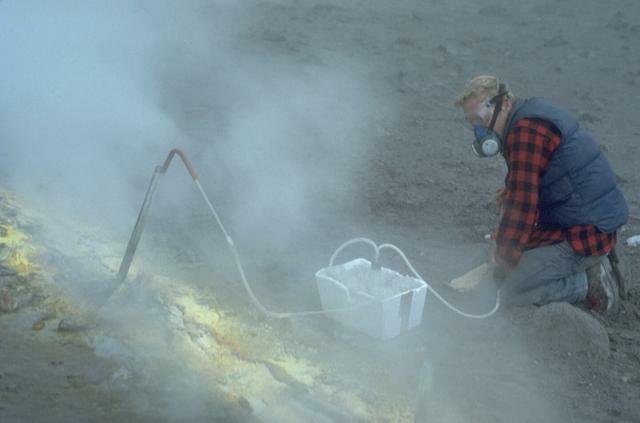 Volcanologist Bob Symonds takes gas samples from a sulfur-encrusted fumarole at the summit of Augustine volcano during a quiescent period of the 1986 eruption. Fumarole condensates had a pH of between 0 and 0.5. The maximum gas temperatures measured were 625-645 degrees Centigrade. These islands and peninsulas on the north coast of Augustine Island were formed in 1883 when collapse of the summit produced a large debris avalanche. The highly mobile avalanche traveled half of its 8-km runout beyond the pre-1883 shoreline and extended the shoreline of the island up to 2 km. Pyroclastic flows from the 1883 eruption also reached the new coastline and form the light-colored deposits at the lower left. Photo by Lee Siebert (Smithsonian Institution). The small island in the foreground is a hummock of a debris avalanche produced by collapse of the summit of Augustine volcano about 450 years ago. The avalanche swept into Kamishak Bay and traveled a total distance of 11 km from the summit, forming the 2 x 3 km wide West Island across a shallow lagoon from Augustine Island. The fine-grained component of this avalanche hummock has been removed by the powerful Cook Inlet tides. The eruption was accompanied by a small lateral blast. Several features of the 1883 eruption, the largest at Augustine during historical time, can be seen in this 1987 photo of the north flank. The hill across the shallow lagoon at the lower right is a debris-avalanche hummock produced by collapse of the summit and north flank in 1883. The source of the avalanche is a large horseshoe-shaped crater that is largely filled by 20th-century lava domes, but whose outer wall is in the shadow to the left. The rolling area covered with sparse green vegetation is a pyroclastic-flow deposit from the 1883 eruption. 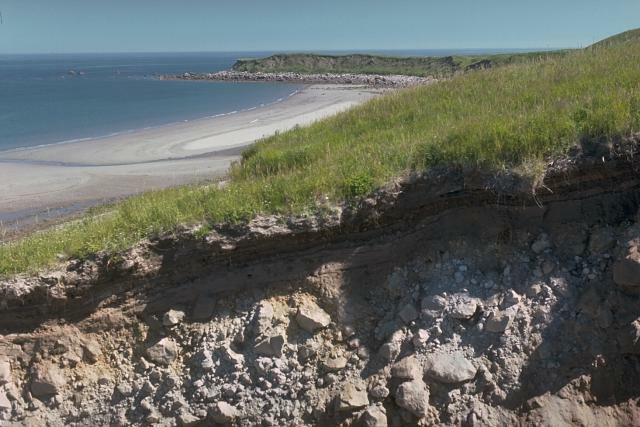 This hilly terrain is the surface of the roughly 450-year-old West Island debris-avalanche deposit, which forms the entire 2 x 3 km wide West Island. 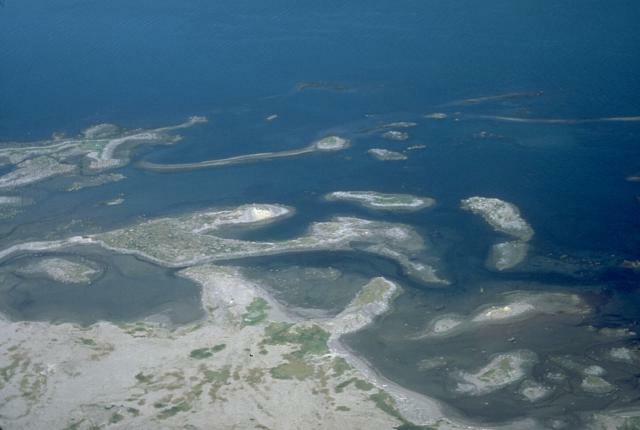 More than 1000 hummocks of heights up to 30 m dot the island. Bathymetric surveys suggest that the avalanche traveled an additional 3 km beyond the margin of West Island. The flatter areas in between hummocks are underlain by deposits of a lateral blast that accompanied the avalanche. This photo looks away from the volcano to the NW across Kamishak Bay to the Chigmit Mountains. 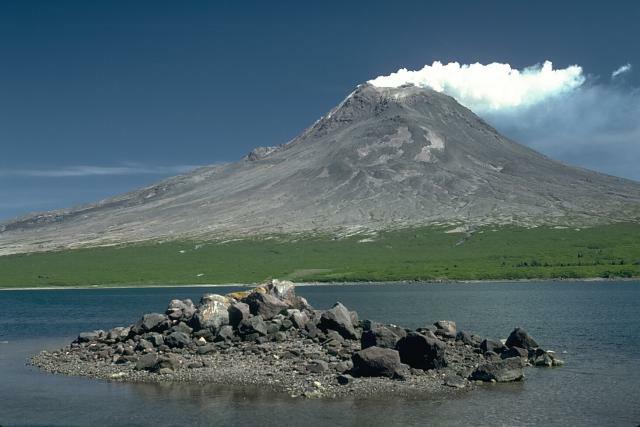 The recent history of Augustine volcano has been characterized by repetitive failure of the summit of the volcano, producing debris avalanches that reached the sea on all sides of the island. This gully near the east shoreline exposes one of the earlier debris-avalanche deposits of Augustine. The Northeast Point debris-avalanche deposit forms the headland in the distance. Most of the Augustine debris avalanches were sufficiently mobile to reach the sea, and form rocky deposits such as can been seen offshore from Northeast Point. Photo by Lee Siebert, 1990 (Smithsonian Institution). Volcanologist Jurgen Kienle hoists a light-weight block of pumice at the toe of a 1986 pyroclastic-flow deposit at Alaska's Augustine volcano. A pyroclastic-flow apron was formed by the accumulation of many individual lobes. Thermal measurements more than 100 days after the eruption showed a maximum temperature of 525 degrees Centigrade at a depth of 6 m. Pumiceous pyroclastic flows during the 1986 eruption traveled about 5 km from summit and reached the sea on the north and NE coasts of Augustine Island. This wave-cut section exposes the interior of the Burr Point debris-avalanche deposit from the 1883 eruption of Augustine volcano. The color mottling, which results from the transport of discrete segments of the volcano that are not thoroughly mixed, is a characteristic texture of debris-avalanche deposits. The scale bar is 2-m high. The rolling, vegetated terrain in this photo is the surface of the Rocky Point debris-avalanche deposit, produced by collapse of the summit of Augustine about 200-400 years ago. The avalanche traveled into Cook Inlet, visible at the upper left with the Chigmik Mountains in the background, for a distance of 8 km and extended the shoreline of the island 1 km. Its surface is more rounded than the adjacent 1883 debris-avalanche deposit because it was eroded by a tsunami produced by the 1883 debris avalanche. This dramatic landsat thematic mapper image was taken on August 28, 1986, as Augustine volcano produced a powerful explosive eruption. The 11-km-high ash cloud rises from the summit crater to the top of the false-color image, which was taken from a satellite in a 700-km-high orbit. The red area is a hot pyroclastic flow traveling down the north flank. Snow and ice show up as shades of blue and vegetated areas along the coast are green. The dark areas descending the flanks are the paths of mudflows and cooled pyroclastic flows. 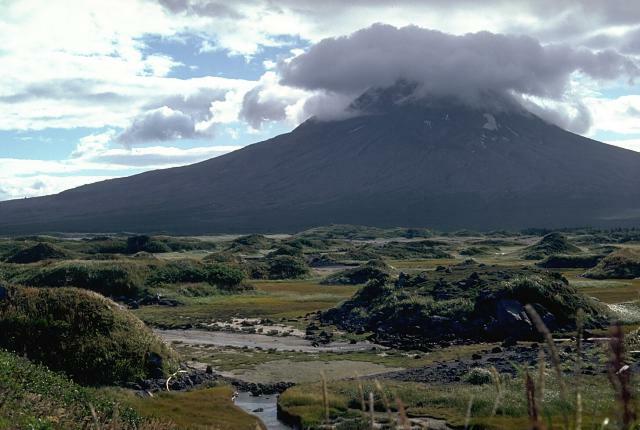 Augustine is the only island volcano of the eastern Aleutian arc. It forms an 8 x 12 km island in Kamishak Bay, in the southern Cook Inlet. The 1252-m-high volcano's cone is a complex of overlapping summit lava domes. An apron of pyroclastic debris, consisiting mostly of large debris-avalanche deposits produced by collapse of portions of the summit lava domes, extends to the sea on all sides. West Island, product of a roughly 450-year-old debris avalanche, appears at the lower left in this 1989 view from the west..
Photo by Tom Miller, 1989 (Alaska Volcano Observatory, U.S. Geological Survey). A vigorous eruption column rises over the summit of Augustine volcano on March 31, 1986. The eruption column reached a height of 12 km. Powerful explosions during the initial days of the 1986 eruption, which began on March 27, removed portions of the 1976 summit lava dome. This view from the SW shows a darkened area downwind that is caused by ash falling from the eruption cloud as it travels away from the volcano. A pyroclastic flow sweeps down the north flank of Augustine volcano in Alaska on March 30, 1986, 3 days after the start of a 5-month long eruption. A large convecting ash column rises above the moving pyroclastic flows. As with many Augustine eruptions, early pyroclastic flows were pumice rich; later in the eruption block-and-ash flows were produced by collapse of a growing lava dome. The 1976 lava dome, seen from the east in this 1982 photo, is enclosed within an arcuate, steep-walled crater rim that was produced by explosive removal of part of the 1964 lava dome early during the 1976 eruption. The surface of the dome consists of rough, irregular blocks of andesitic lava. The small peak at the upper right is a remant of the 1935 lava dome. Steam rises from the 1976 dome in the center of the photo and from fumaroles at the summit of the 1964 dome remnant at the upper left. Photo by Chris Nye, 1982 (Alaska Division of Geological and Geophysical Surveys). The 1986 lava dome at Augustine volcano is topped by a 50-m-high spine. Steam rises from the base of the rough-textured lava dome, which was constructed within an arcuate crater cut in the 1976 lava dome. The surface of the 1976 dome is covered in this 1987 view from the SE with smooth-textured pyroclastic ejecta from the 1986 eruption. Both the 1976 and 1986 lava domes lie within an arcuate crater cutting the 1964 dome, which forms the high point of the volcano at the left. Photo by Alaska Volcano Observatory, U.S. Geological Survey, 1987. The summit lava dome complex of Augustine volcano rises to 1252-m above its SW flank. The upper part of the summit is formed by a lava dome from the 1963-64 eruption. Pre-Augustine sedimentary basement rocks of Jurassic to Tertiary age are exposed on the south flank to an elevation of 320 m.
Photo by Game McGimsey, 1994 (Alaska Volcano Observatory, U.S. Geological Survey). Large Eruptions of Augustine Information about large Quaternary eruptions (VEI >= 4) is cataloged in the Large Magnitude Explosive Volcanic Eruptions (LaMEVE) database of the Volcano Global Risk Identification and Analysis Project (VOGRIPA).